Disney Cruise Food is a huge part of your enjoyment of your cruise experience. One thing is for sure. You will never go short of food on a Disney Cruise. Here we share the Ultimate Guide to Disney Cruise Food. 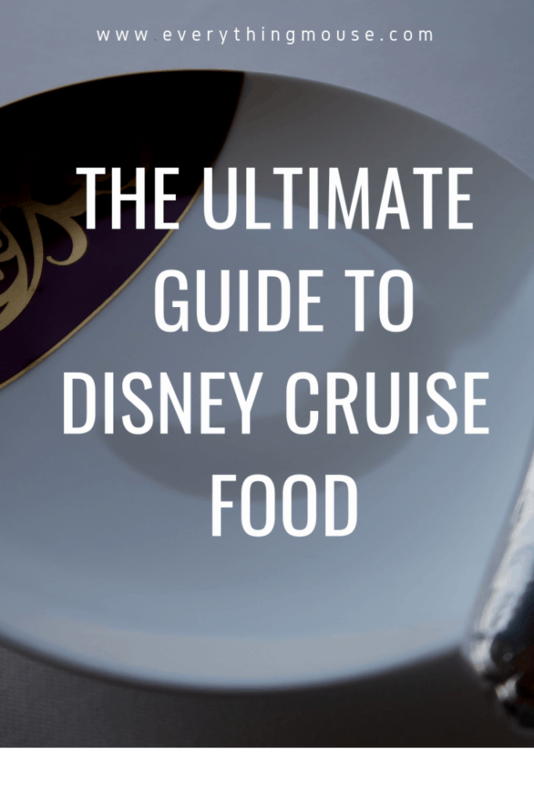 You will find the most comprehensive guide to Disney Cruise Food out there. Including lots of Disney Cruise food pictures. Join my Disney Cruise Group for Tips and Exclusive Free Giveaways! You will usually board your Disney cruise at around lunchtime. Often the very first thing that people want to do is eat! 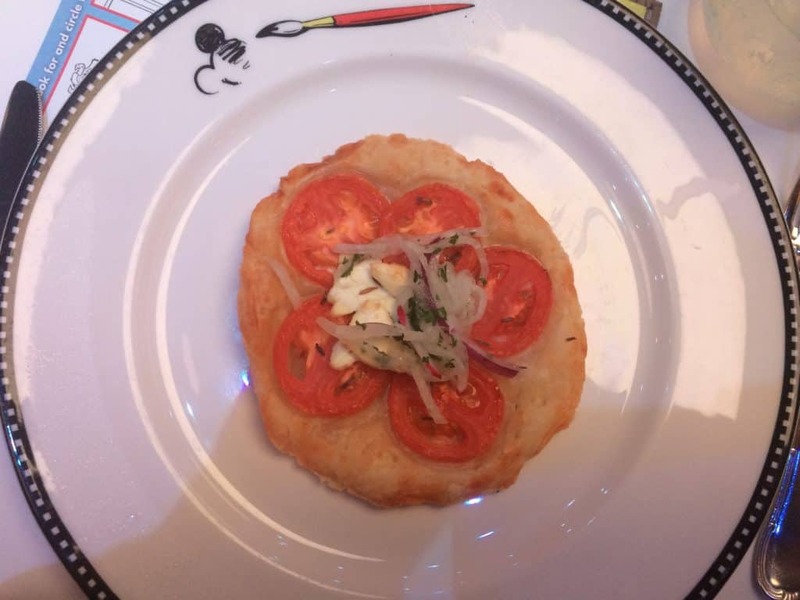 There are a number of alternatives for your Disney Cruise Embarkation Lunch. Most people head straight to Cabanas Buffet. This has a huge selection of different things to eat. The buffet will also most likely be very crowded! 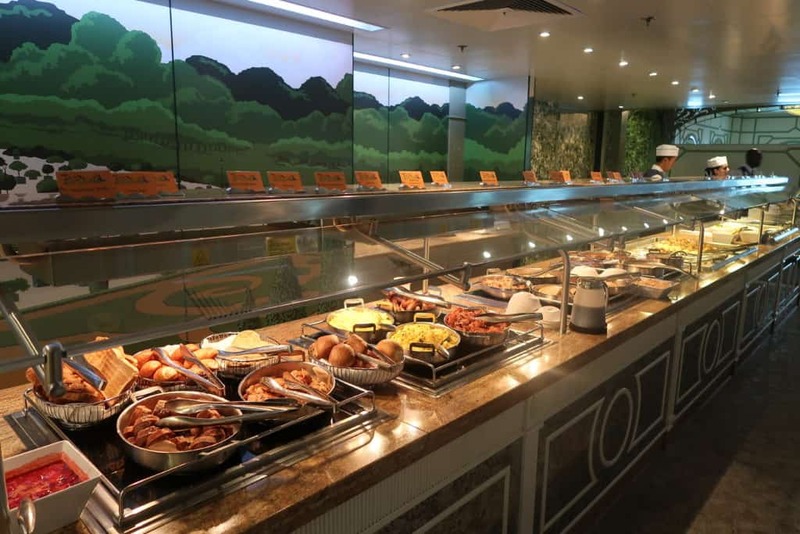 This is pretty much the busiest that you will see the Cabanas buffet for the whole of your cruise. Everyone wants to get their first test of Disney Cruise Food. If you want a sit down lunch from an a la carte menu this is also offered. On the Fantasy and the Dream you should head to Animator’s Palate if you want the sit down embarkation lunch. This is located on Deck 3 Aft of either ship. On the Disney Wonder you should go to Triton’s. On the Disney Magic Lumiere’s is the place to be. These restaurants are on Deck 3 of each ship, very close to the place where you will most likely walk on to the ship. 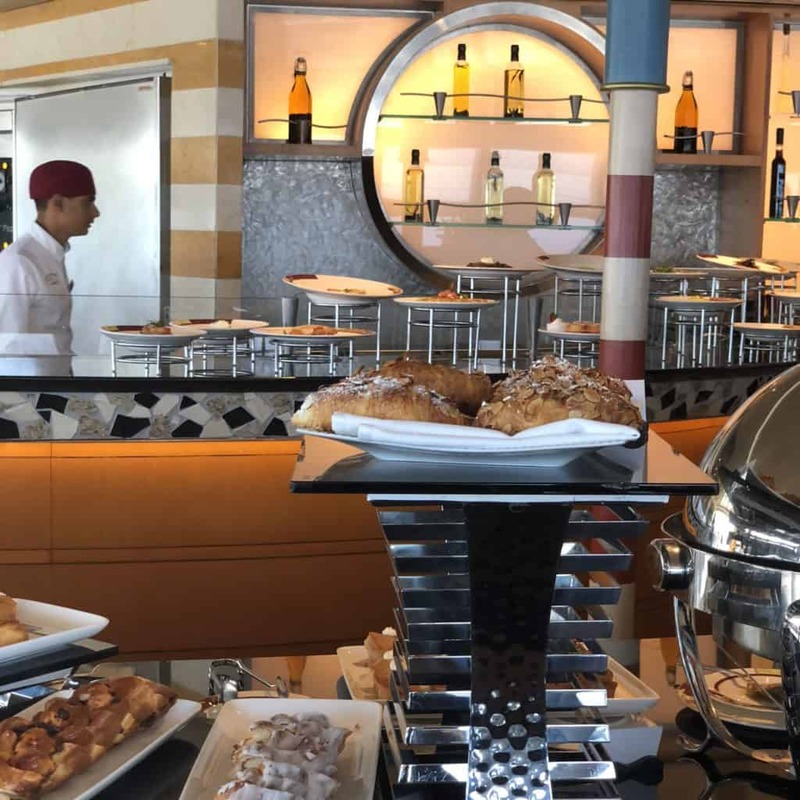 If you are fortunate enough to travel as a Disney Cruise Concierge Guest your embarkation lunch will be separate from the rest of the ship’s guests. If you are a sailing Concierge with Disney Cruises you can go to Enchanted Garden on the Disney Dream and Fantasy. If you are sailing on the Wonder you can go to Tiana’s Place. On the Disney Magic, you can go to Rapunzel’s Royal Table for your embarkation lunch. 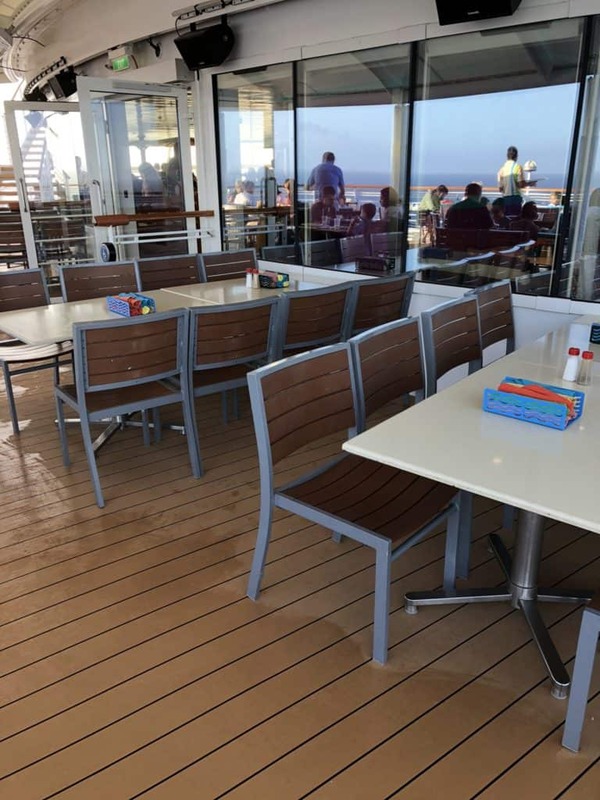 You can also dine in the general embarkation lunch location. You can have snacks in the Concierge Lounge. Or you can go to the Cabanas Buffet. 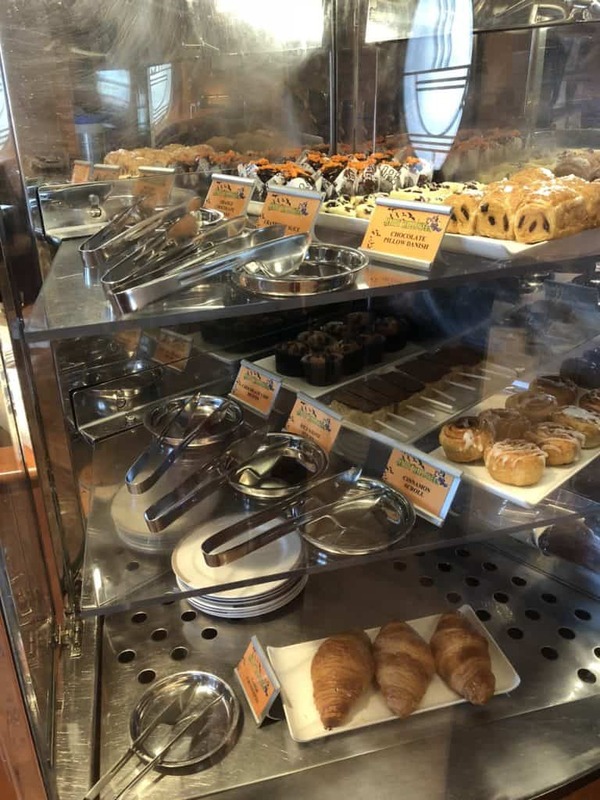 You have so many choices of Disney cruise food! Disney cruise lines are exceptional in handling any food allergies which guests may have. I have sailed when on a Gluten Free diet and was very well cared for. When you book your Disney cruise you can ask for it to be noted that you have food allergies. 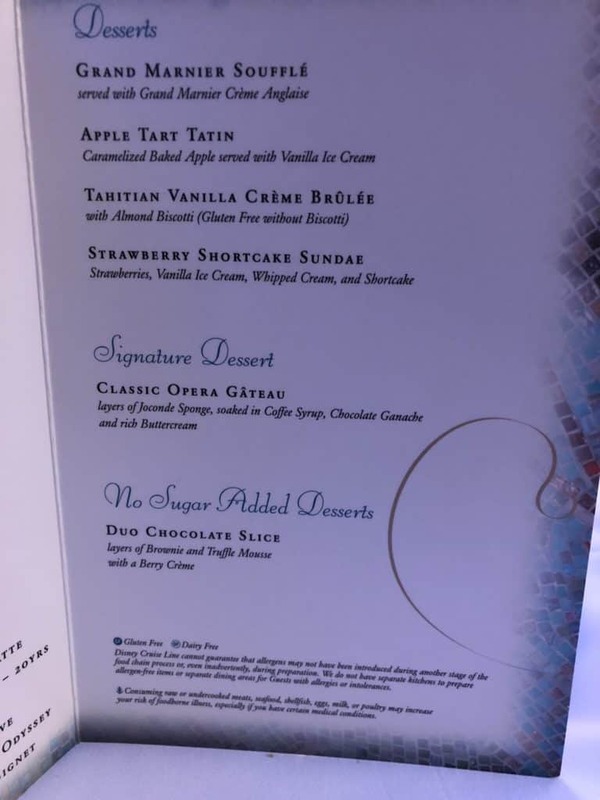 Items are marked as Gluten Free or Dairy Free on the Disney Cruise menus. However, you should always talk with your server to see if there are any additional menu options. Your servers will always bring you Gluten Free Bread if you request it. In the Cabanas Buffet, you should always tell a crew member about your food allergy. They will help you and show you the items which are safe for you to eat. If you have food allergies you can be confident that Disney cruise lines will do all they can to help you. Disney Cruise lines do things slightly differently to every other cruise line. They have what is known as Rotational Dining. What is Disney Rotational Dining? Each of the Disney Cruise ships has three main restaurants. You will visit each Disney cruise restaurant at least once during your vacation. The unique element is that you will rotate around the restaurants and visit a different one each night. This is such a brilliant idea. Not only do you get to experience all the different main dining restaurants on a Disney cruise, and your servers will rotate with you. 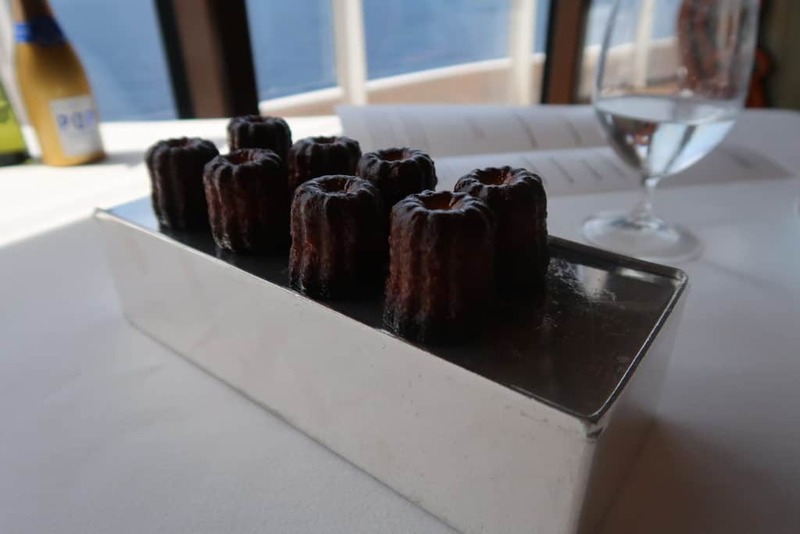 This is such a simple idea, but it makes dining on a cruise so much better. You will have the same servers who will get to know your dining preferences. Having the same servers every day means that they will know if you always want a certain drink. It will be waiting for you at your table when you arrive. Your servers can get to know your dining preferences so that they can recommend the best options for you from the Disney Cruise Menus. Disney servers are particularly brilliant with the kids as well. Don’t be surprised if they cut up their food for them or serve out a Mickey shaped ketchup portion! 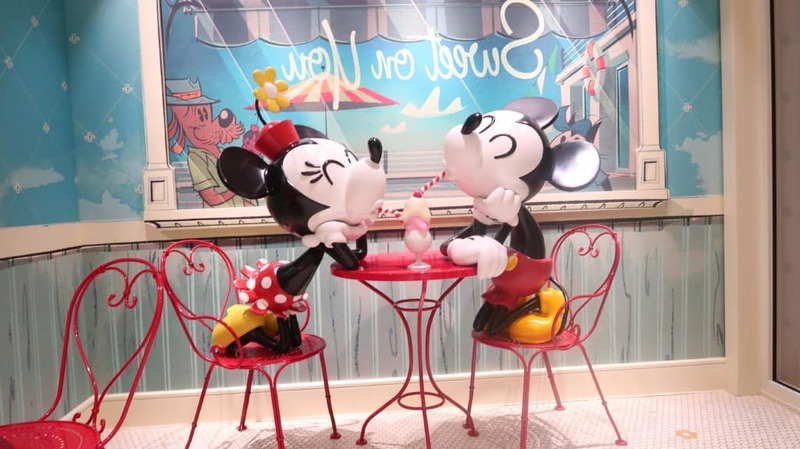 How will you know which Disney Cruise Rotational Dining schedule you have? That’s easy. Just look at your Key To The World Card. You will see your Table Number and Dining Time on your card. You will also see a collection of capital letters such as ERAERRA. Each letter is a different restaurant. So in that example, you would dine in Enchanted Garden, then Royal Court, Animators Palate, Enchanted Garden, Royal Court, Royal Court and then end in Animator’s Palate. There are two set times for Disney cruise dining in the rotational restaurants. Main seating starts from 5.45 and 6.15pm. Second Seating begins between 8.00 and 8.30 pm. On most sailings, Main Seating will start at 5.45 pm and Second Seating at 8.15 pm. The later times tend to be on the Alaskan and Mediterranean Disney cruise itineraries. You can request which of these dining times you want when you book your Disney cruise. 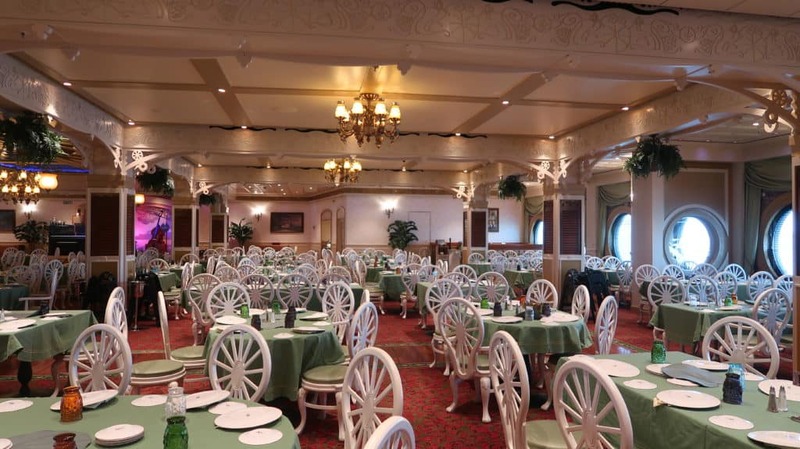 The Main Seating is the most popular of the Disney Cruise dining times. Quite often when you book, you will find that this Main Seating is no longer available to request online. 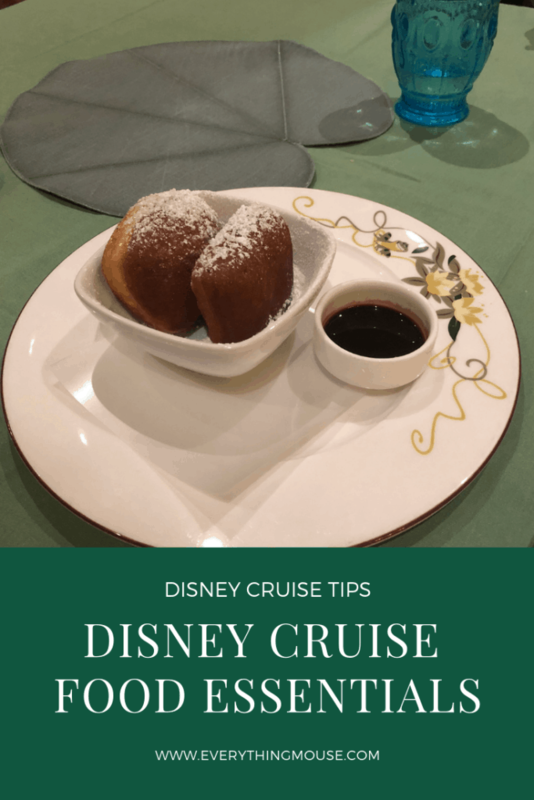 What do you do if you want to change your dining time on a Disney Cruise? If you do not get your first request when you book, there are two things you can do. The first is to call Disney cruise lines or ask your travel agent to call and request that you are wait listed for the time that you would prefer. You can also ask for a specific table size and even request a certain server if you know who you want. Your Key To The World will tell you which Disney Cruise dining time you have. If it still isn’t what you want when you board the ship, you can ask for it to be changed. You will see on your Disney Cruise Navigator where the dining staff will be located. Go to that location and ask if it is possible to change your Disney cruise dining time. 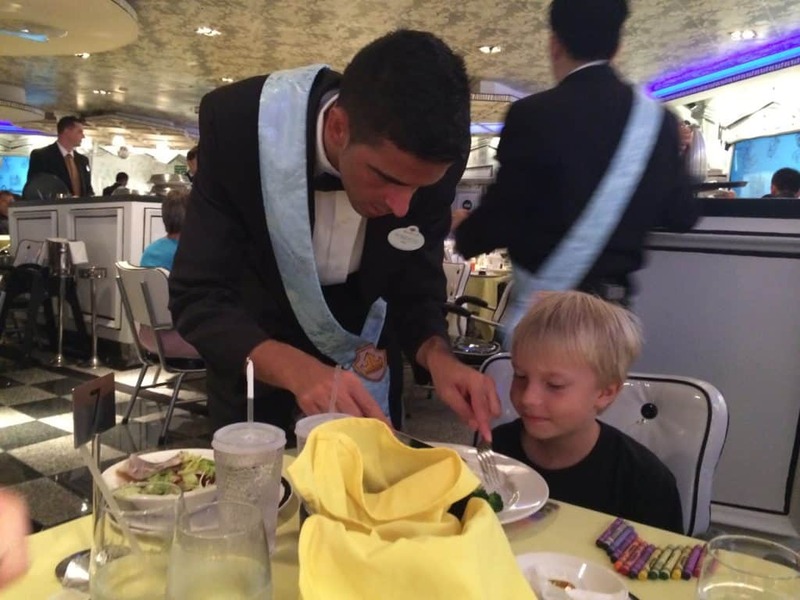 The Disney cruise dining team will always accommodate your request if they possibly can. Families with young children particularly like the Main Seating time. It is late for a young child to start to eat at 8.00 pm. However, Disney has thought of something that will help families who have the second dining. The young ones are served first. There will be members of the Kids Club team waiting in the restaurant at a certain time to take your children to the club once they have finished eating. You can then enjoy the rest of your meal without the children. I always used to want the Main Dining on a Disney cruise. However, I have recently converted to enjoying the Second Seating. I enjoy seeing the show before dinner. Your servers also have a little more time to chat with you at Second Seating. Another advantage of Second Seating is that you have the later breakfast on your final morning. This means that you can sleep in for a bit longer! 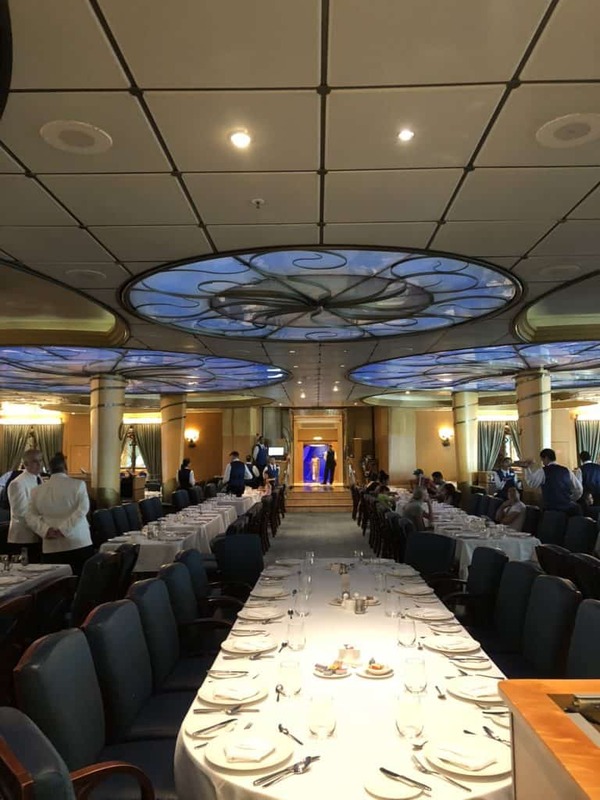 What are the table sizes on a Disney cruise? You do have the chance to request a certain table size. Whilst it cannot be guaranteed, Disney always does it’s best to accommodate any requests for specific table sizes. The table sizes in the Disney Cruise Restaurants are generally for 4, 6 or 8 people. Usually, Disney will seat you will another family unless you request that you do not want to do this. It can be a great way to meet people. Disney is great at matching people who have similar interests. Often, if you have children you will be seated with a family with kids of the same age. However, not everyone wants to share a table. If you would prefer to just be seated with your own party then you can call Disney and have them note this on your special requests. Your Disney Travel Agent can do this for you if you have one. You can request a table for 2. Every time we have done this there hasn’t been a problem. We have been seated at a table for 4 people, so there are 2 empty spaces. Disney will also accommodate parties with more than 8 people. They will put tables together so that you can be seated together. For more information about Disney Cruise Dining Times Click Here. On each of the Disney ships, there are three main dining restaurants. These are the restaurants where you will enjoy rotational dining. All of the Disney Cruise ship restaurants have a theme and many of them have special shows and character appearances. 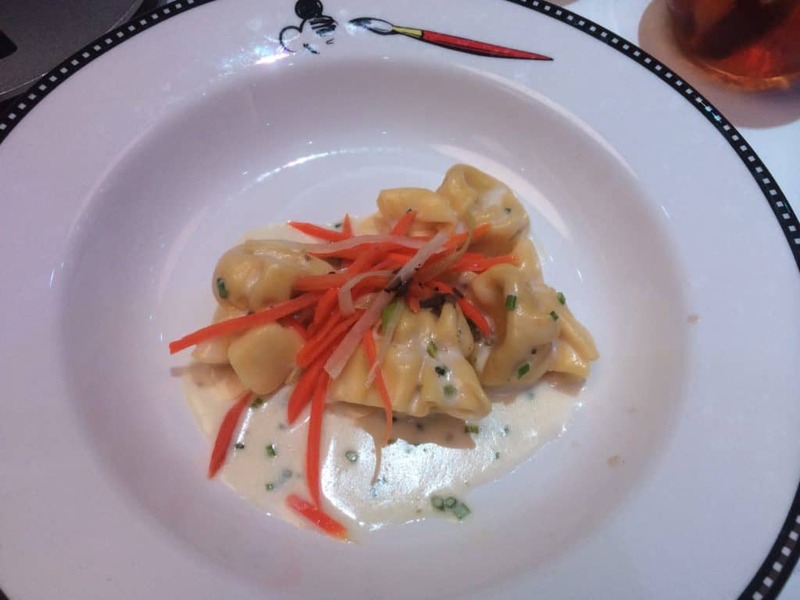 These restaurants have some of the very best Disney Cruise food on the ship. All of the Disney ships have Animator’s Palate restaurant. This is the only restaurant which is available on all of the Disney ships. 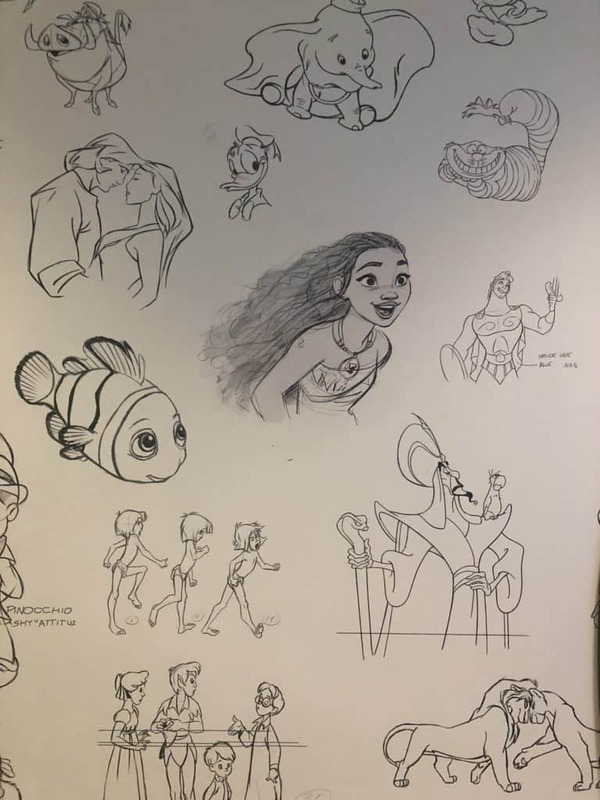 I am also betting that the new Disney Cruise Ships which will be launched in 2021, 2022 and 2023 will each have their own Animator’s Palate. Here we will highlight each of the Disney cruise restaurants so that you can see what to expect on each ship. 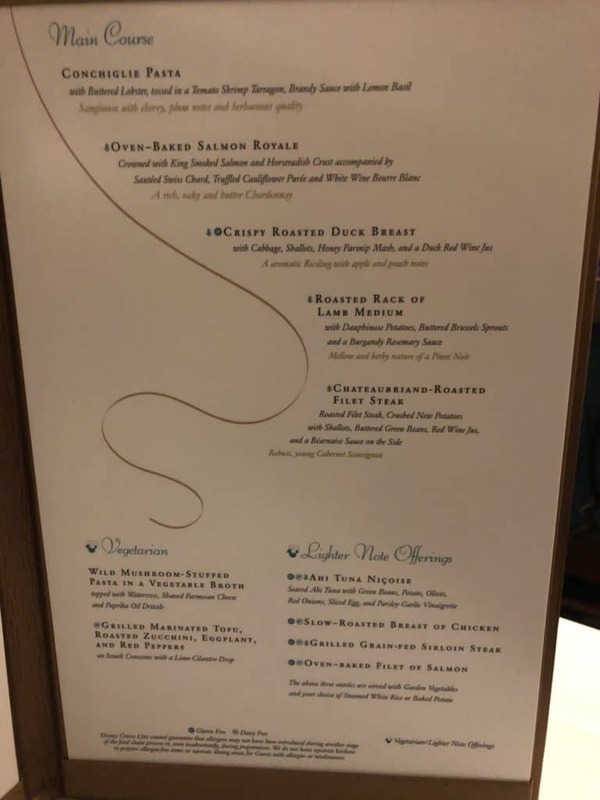 Each of the restaurants has its own menu on each Disney ship. You will, however, find some overlap. 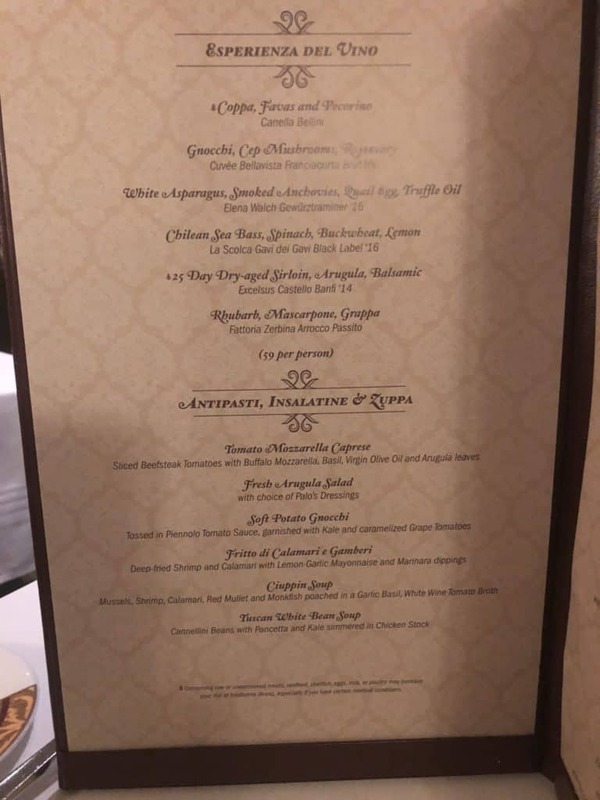 For example, all the Animator’s Palate menus are the same whichever ship that you dine on. Royal Court, Royal Palace and Triton’s also have the same menu. 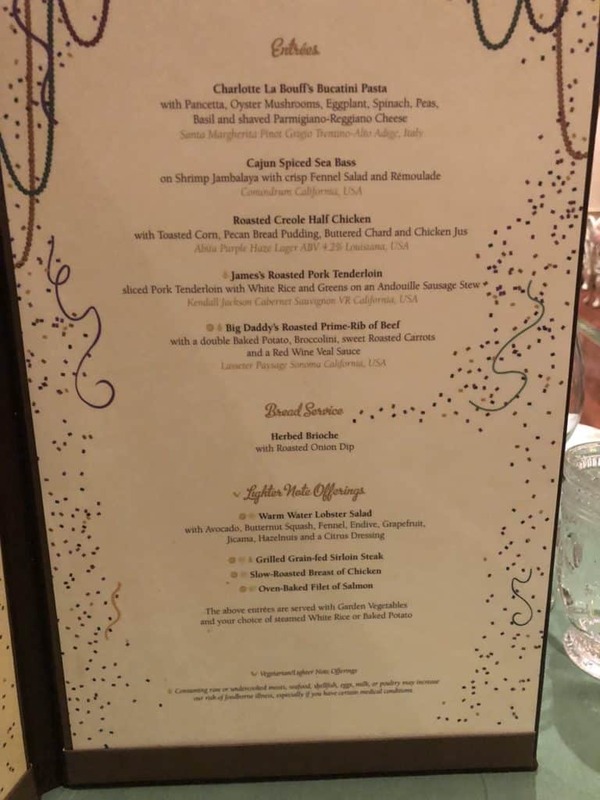 In addition to the standard menus in each Disney cruise restaurant, they have some special menus which are served on certain itineraries. For instance, the Alaskan cruises have some special menu items. 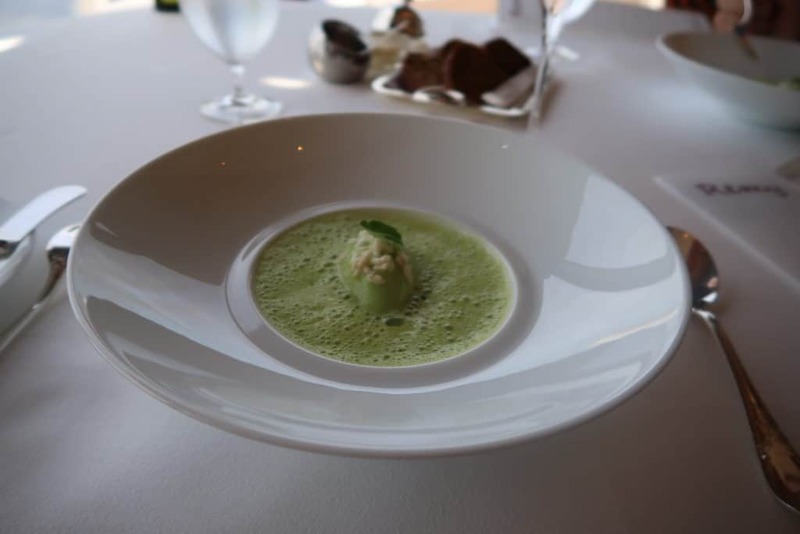 The longer cruises such as the Panama Canal and the Transatlantic Cruises also have their own special menus. Another special menu which will be served on all Caribbean, Bahamian and Mexican cruises is the Pirate Night menu. 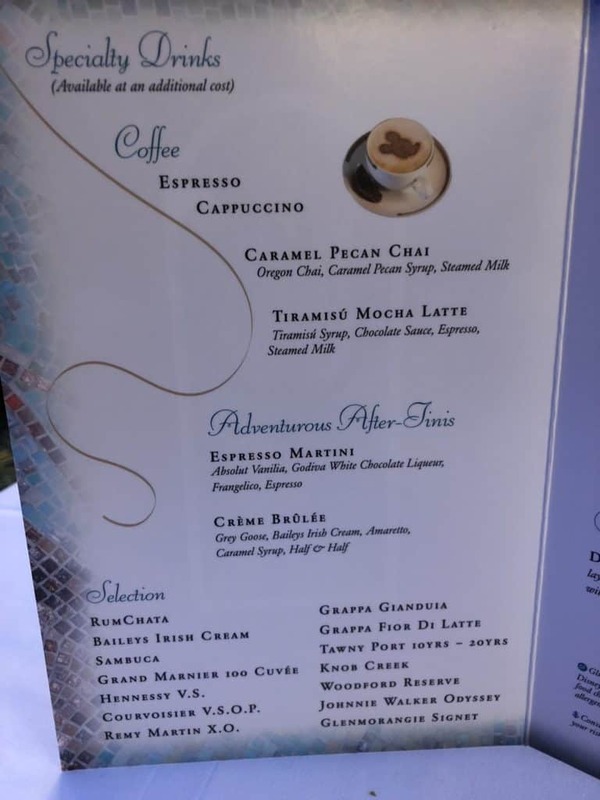 Star Wars at Sea and Marvel Day at Sea also have special themed menus. Animator’s Palate is the only restaurant which is on all four of the ships. It is one of the most popular (although Tiana’s Place and Rapunzel’s Royal Table are now pretty close in the popularity stakes). Walt Disney said, “I only hope that we don’t lose sight of one thing – that it was all started by a mouse.” Animator’s Palate celebrates Disney’s foundations and celebrates the animated movies of it’s past and present. The first thing that you will notice is the television screens which line the walls of Animator’s Palate. 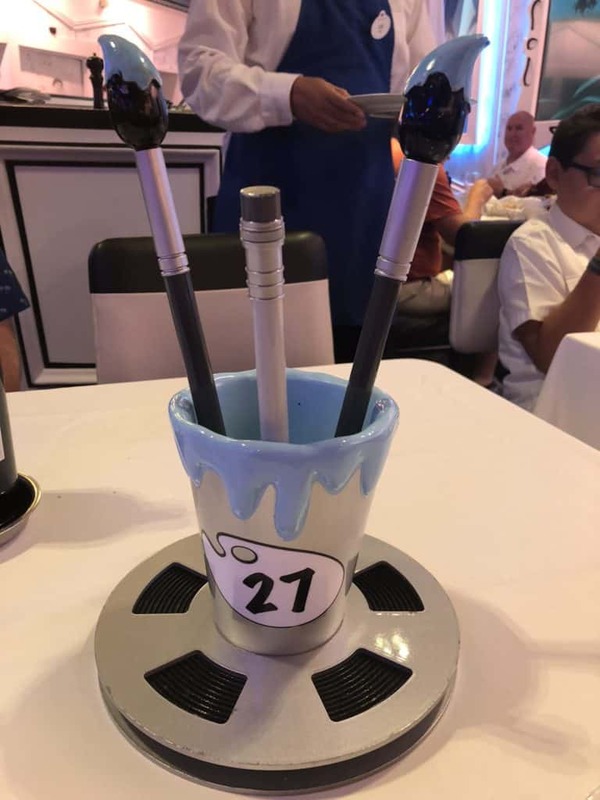 If you are sailing on the Disney Fantasy or the Disney Dream take some time to walk around the restaurant and look at the numerous shelves of animation memorabilia. 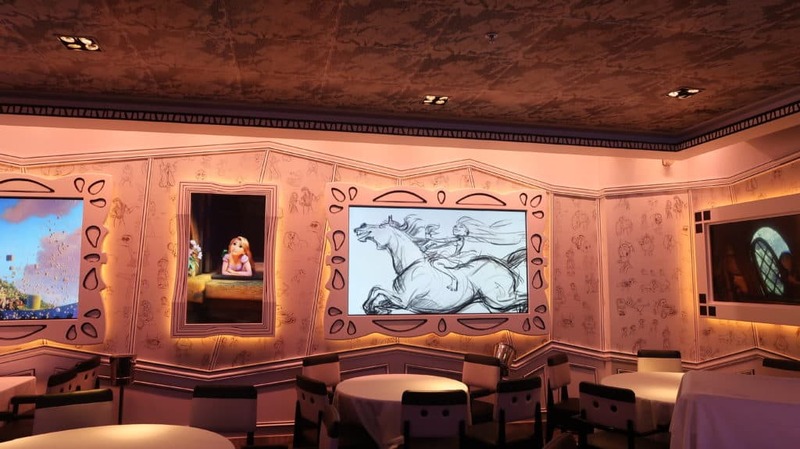 There are two dinner shows in Animator’s Palate. This restaurant is all about getting the diners involved in the immersive experience. 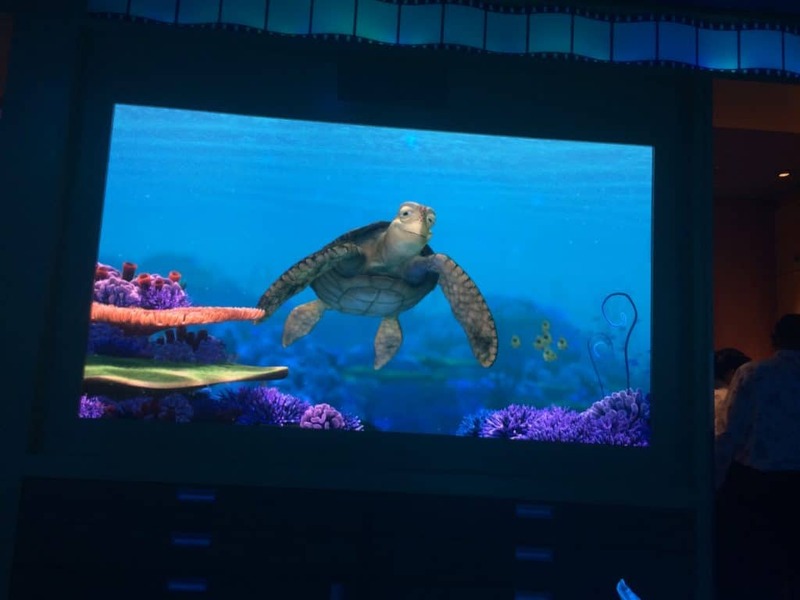 One show on the Disney Dream and the Fantasy will have you talking with Crush from Finding Nemo. Yes, he really can hear what you are saying at your table. If you are one of the lucky ones you will get to have a conversation with him during your dinner. The other Animator’s Palate show tests your drawing skills. You will be given a special piece of paper to draw a character on. Make sure you follow the guidelines on the paper so it shows up the best on the screen. You Servers will take the paper and at the end of your meal, your own very individual animation will be brought to life on the screen. Animator’s Palate is a whole lot of fun. We particularly like it on the Disney Wonder where Mickey Mouse himself makes an appearance. If you are not on a 7 night sailing you will not get the chance to do both of the shows. Just another reason to always do at least a 7 night cruise on a Disney ship! The Disney Cruise Enchanted Garden Restaurant is one of the most stunningly beautiful of all of the rotational dining venues. Enchanted Garden is located on Deck 2 of the Disney Fantasy and the Disney Dream. The design is modeled after the Gardens of Versailles. The first thing that you will notice as you walk into Enchanted Garden is the seven foot tall Mickey fountain which is the center piece of the room. On each side are the much coveted Enchanted Garden booths. There aren’t many available and they are the most popular seating in Enchanted Garden. They seat up to four guests. You can add a special request prior to your cruise by calling Disney Cruise Lines. The decor is a beautiful combination of greens and whites. The lighting is a very important part of the effect. There are numerous glass flowers which open as the sky becomes darker as you progress through the meal. 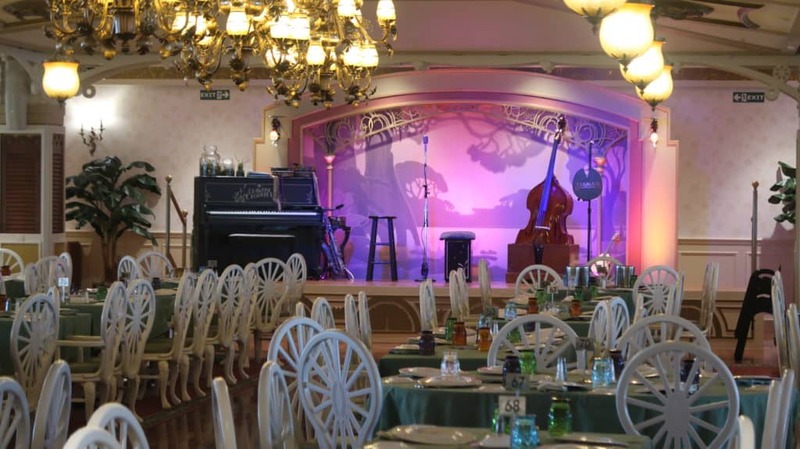 Enchanted Garden is one of the most elegant of all the Disney cruise dining venues. Enchanted Garden on the Disney Dream serves breakfast and lunch on select days. 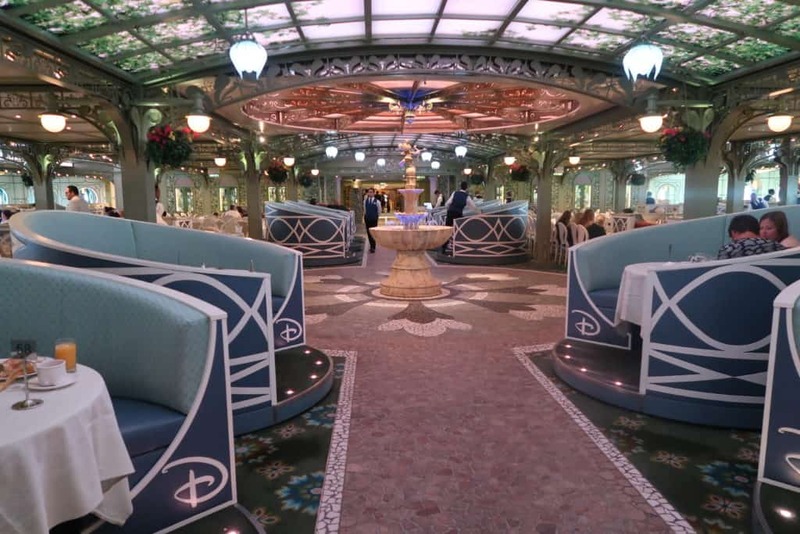 The Disney Fantasy is different as it does not serve breakfast or lunch in Enchanted Garden. It uses Animator’s Palate instead. Dinner is served in Enchanted Garden every day of your Disney cruise on the Fantasy and the Dream. Click Here for an Enchanted Garden Menu. 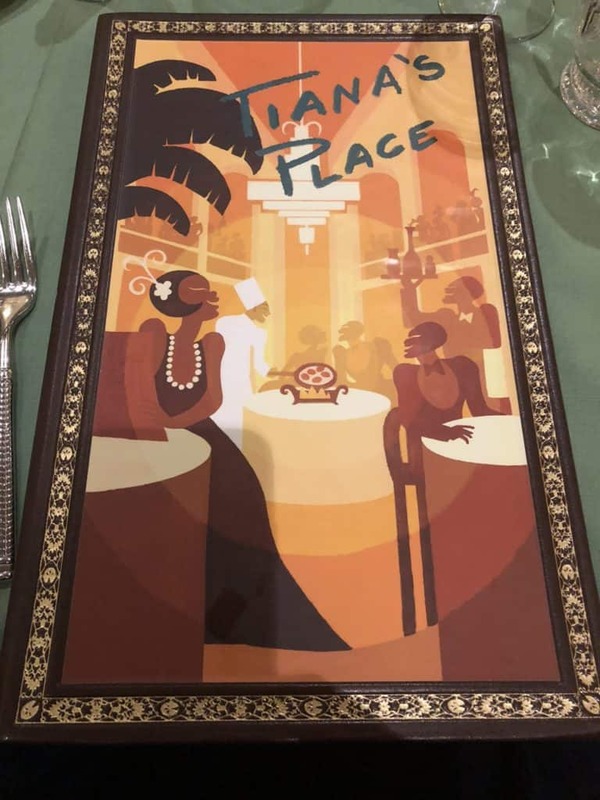 Tiana’s Place is the newest restaurant on the Disney Wonder. It replaced the much beloved but rather dated Parrot Cay. Tiana’s Place is probably the best of all the Disney Wonder Restaurants. The theme is taken from the movie The Princess and The Frog. It is particularly apt of course because Princess Tiana opens her own restaurant in the movie. The attention to detail is stunning. The table is set with beautiful china wear. It even has a lily pad decoration. 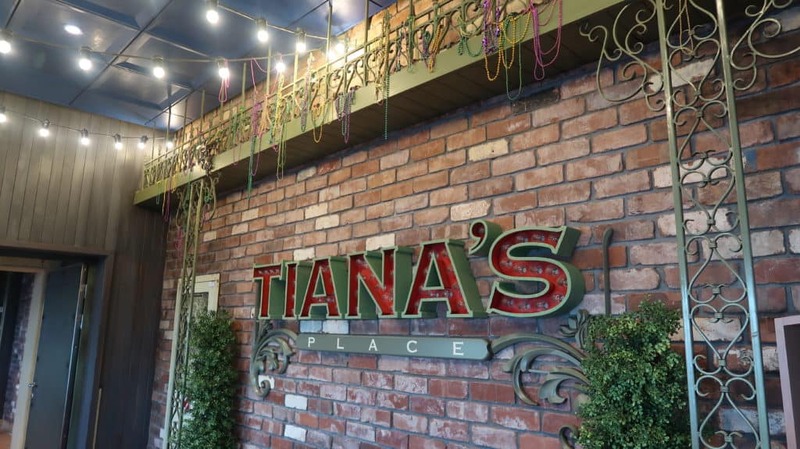 There is plenty of entertainment in Tiana’s Place – just like in the movie. You will get the chance for plenty of quality time with Princess Tiana. She appears with The Crawfish Crooners to sing such favorites as “Dig a Little Deeper”. Tiana spends most of her time walking around the room and visiting every table. It is a great opportunity to meet Princess Tiana. The whole atmosphere in the restaurant is just one big Madri Gras celebration. The one thing which is not so great about Tiana’s Place is that they do not seem to have set the sound levels correctly. It is loud. So loud it can be really difficult to hear what your table mates are saying. 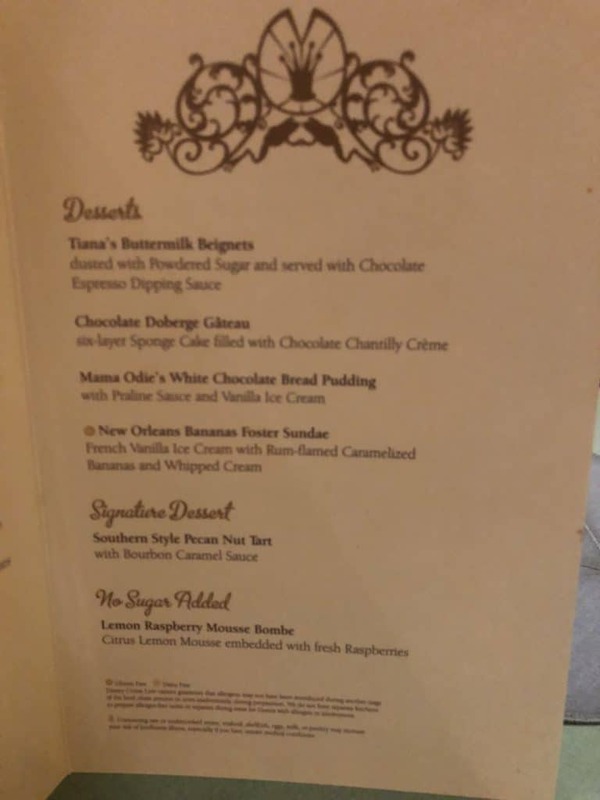 The style of the cuisine is of course New Orleans. I particularly like Mama Odie’s Creamy Tomato Soup with chopped Cilantro as an Appetizer. Eudora’s Artichoke Ravioli with Sautéed Spinach, Lemon Butter, Sage and Pecorino Cheese is a favorite entrée of mine. Choosing a desert is of course easy. It has to be the Beignets! 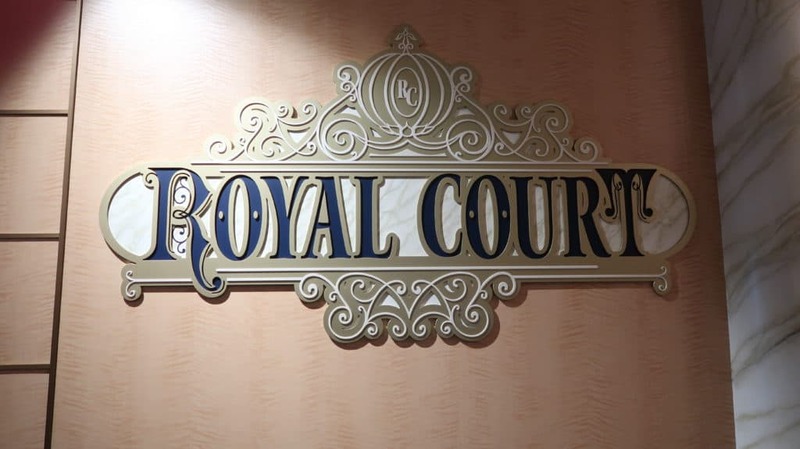 The Royal Palace is one of the rotational dining restaurants on the Disney Dream. The inspiration is of course the Disney Princesses. The decor is very rich and opulent with lots of deep reds and golds. The carpet is a luxurious blue pattern. All the decor comes together to make a restaurant fit for a Princess and her Prince. With every Disney rotational dining restaurant, the servers have a different costume. One of my favorites is at the Royal Palace. The servers are all dressed in an outfit which is reminiscent of the coachmen in Disney’s Cinderella movie. One of the most enchanting details is the bread basket which is in the shape of Cinderella’s Carriage. If only they sold these in the Disney store! This is the almost identical restaurant to the Royal Palace, but it is located on the Disney Dream. The decor is very similar and the menus are the same. This is the newest of the Disney Cruise restaurants. Rapunzel’s Royal Table is located on the Disney Magic. It replaces the short lived Carioca’s. 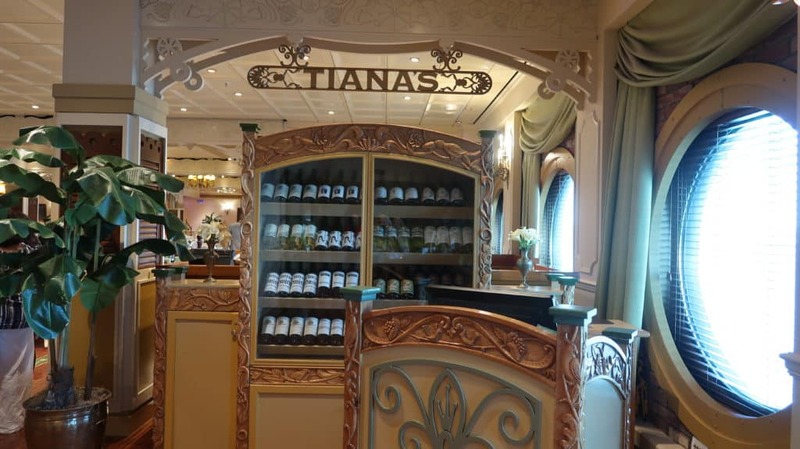 After the success and popularity of Tiana’s Place, Disney cruise lines wanted to celebrate another of the Disney Princesses with a themed restaurants on one of their ships. Rapunzel’s Royal Table is an example of Disney Cruise lines at it’s very best. Imaginative, immersive themed restaurants where you can meet the characters from a popular Disney movie. One of my very favorite Disney movies is Tangled so this has to be one of my favorite restaurants. We think that this is something that we will definitely see on the new Disney ships which will launch starting in 2021. A Disney Frozen themed restaurant just seems like a give on the first new Disney cruise ship. Expect to see Anna and Elsa with their very own themed experience. Click on and watch the video below to get an idea of just what is on offer at Rapunzel’s Royal Table on the Disney Magic. The decor is beautiful. There are 240 Wish Lanterns included in this Bavarian Castle themed restaurant. You will get the chance to sing a long with all of your movie favorites such as “I’ve Got. Dream” and the classic “I See the Light”. You also get to meet your favorite characters Rapunzel and Flynn Ryder. They are joined by the Snuggly Duckling Thugs! Naming menu items after our favorite characters and movie themes just makes it seem so much better. Who can resist the Flynn Rider Platter with grilled smoked pork loin served with roasted smoked pork belly, braised red cabbage, fried potato dumpling, and a wine jus? Or the Oktoberfest Lemon and Thyme Roasted Chicken? Tangled Pasta (Angel Hair — ha! ), Oktoberfest Lemon and Thyme Roasted Chicken, Pan-seared Sea Bass Filet, and the Flynn Rider Platter Tangled Pasta (Angel Hair — ha! ), Oktoberfest Lemon and Thyme Roasted Chicken, Pan-seared Sea Bass Filet, and the Flynn Rider Platter with grilled smoked pork loin served with roasted smoked pork belly, braised red cabbage, fried potato dumpling, and a wine jus. 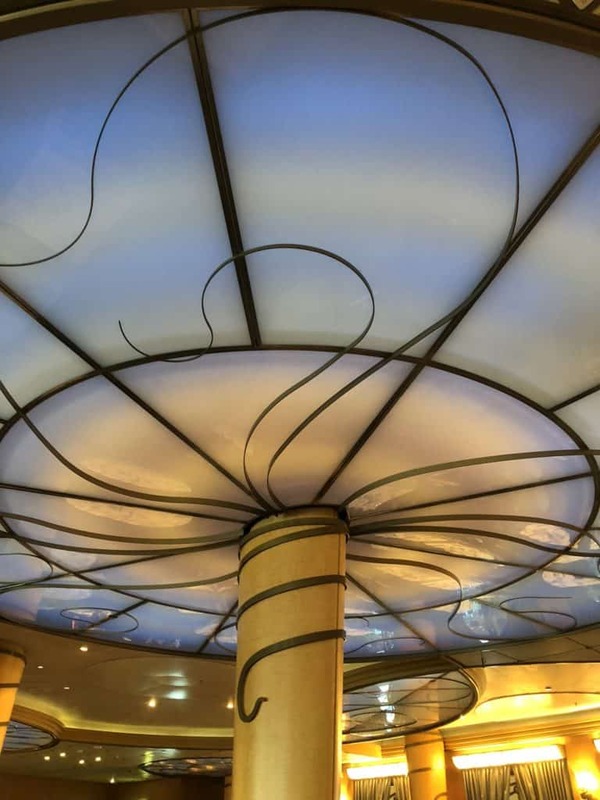 Triton’s restaurant is exclusively found on the Disney Wonder cruise ship. It is located just off the atrium on Deck 3. It is themed after Ariel The Little Mermaid. The thumbing is subtle and it may take you some time to see all the small details. 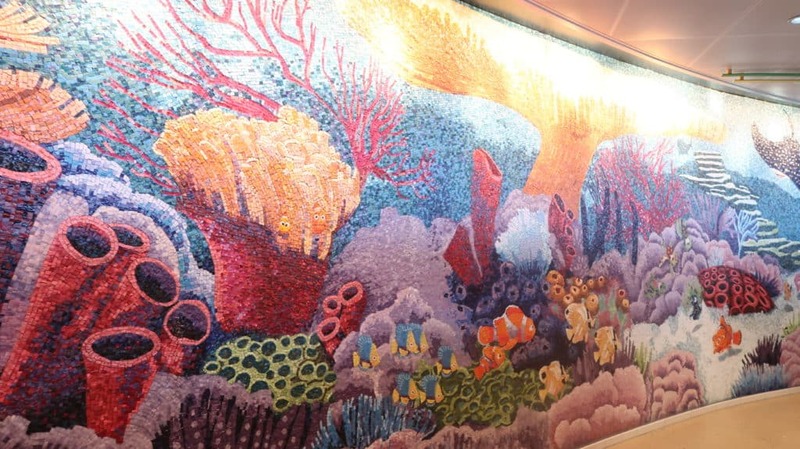 Triton’s decor is made to make you feel as though you are under the sea. 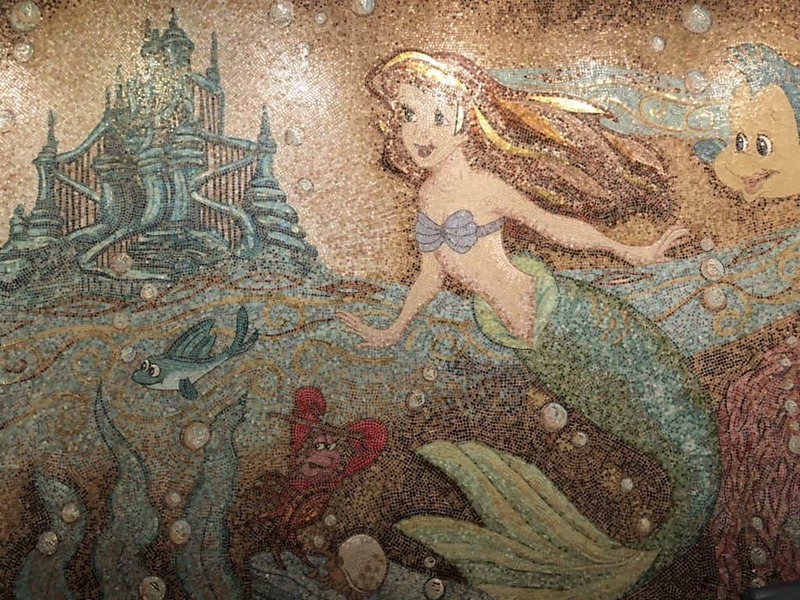 At the far end of the room, you will see a huge mosaic which depicts Ariel and her father King Triton. Triton’s serves breakfast, lunch and dinner. 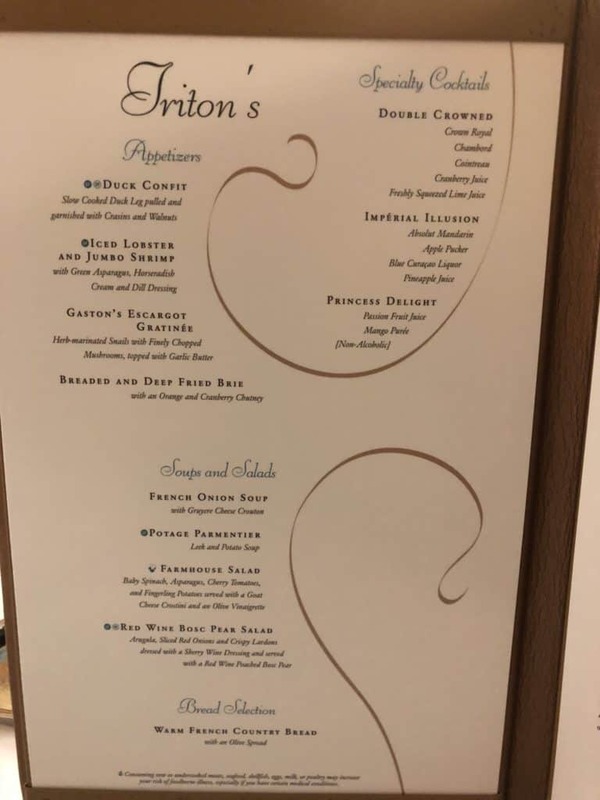 Triton’s is also the restaurant on the Disney Wonder where you can have an a la carte embarkation lunch as an alternative to the buffet at Cabanas. You many want to start your day in Triton’s on the Disney Wonder as it has a sit down breakfast every morning. Triton’s on the Disney Wonder is a beautiful restaurant. Perhaps the most grown up of all the dining rooms, it has some excellent choices on the dinner menu. 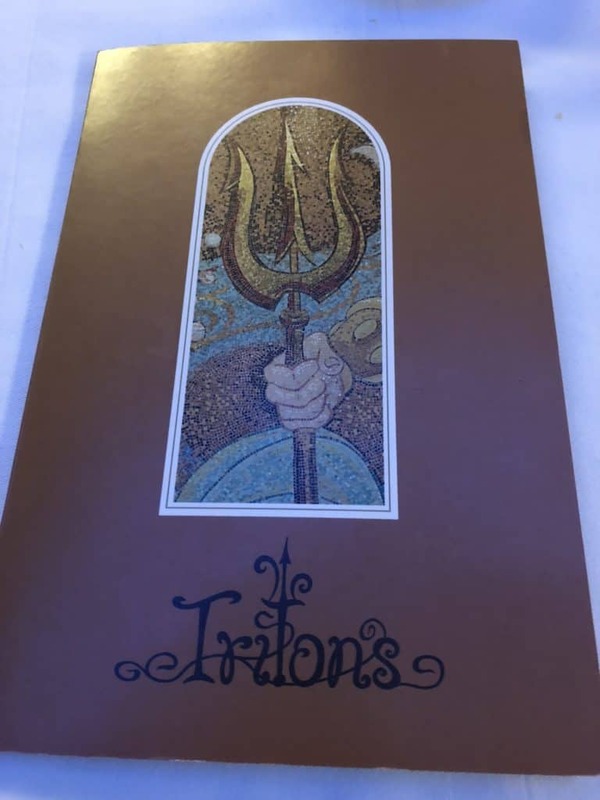 The food at Triton’s is said to be inspired by French cuisine. It shares many dishes with Royal Court and Royal Palace on the Dream and Fantasy. 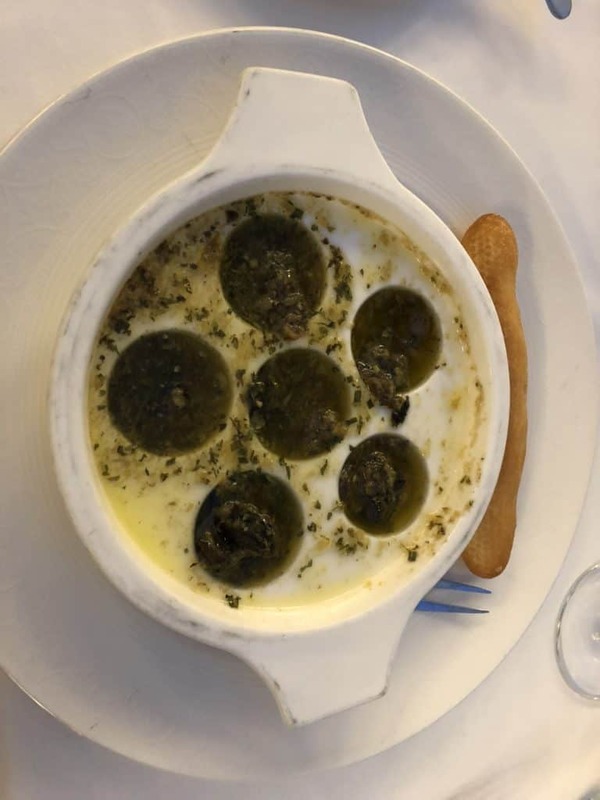 On the appetizer menu, you will find escargot, duck confit and French onion soup. One of my favorite appetizers in Triton’s on the Disney Wonder is the Iced Lobster and Jumbo Shrimp. 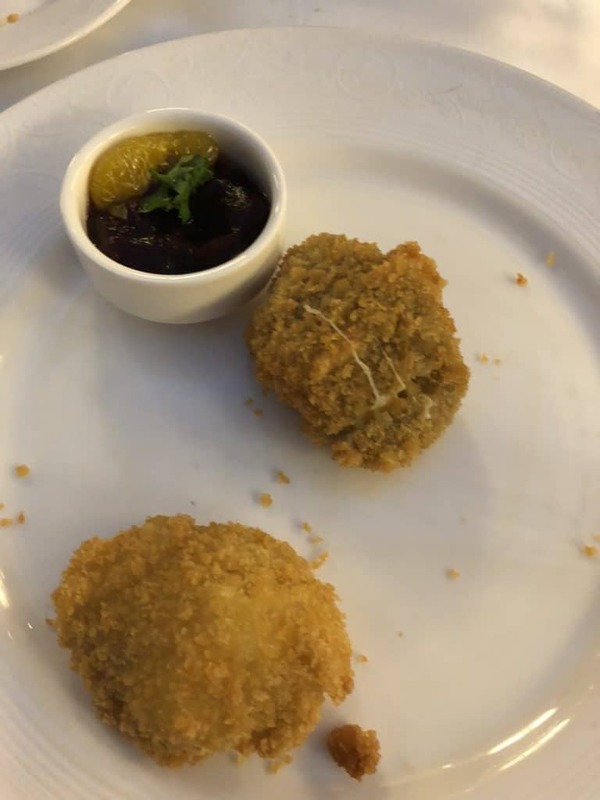 This picture of the Breaded and Deep Fried Brie shows that sometimes presentation isn’t great. However, it tastes really good and is one of the things I always look forward to ordering again. 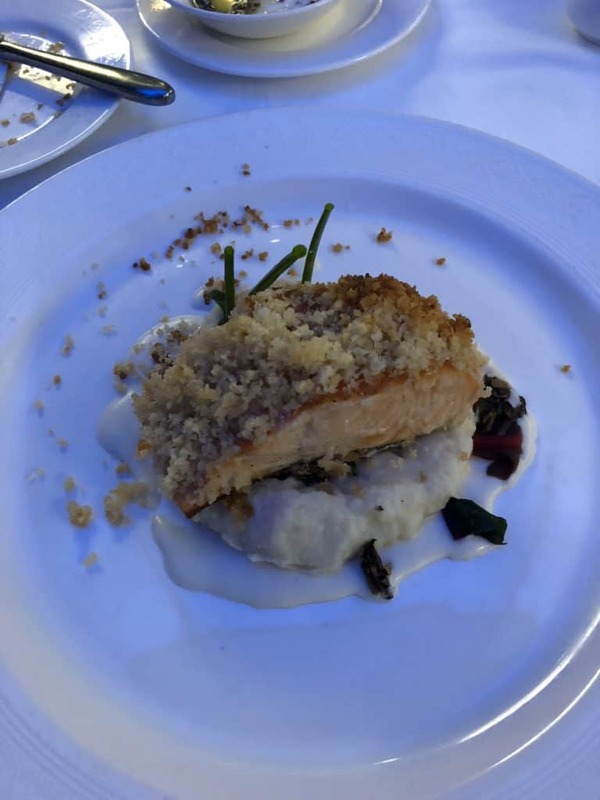 Disney Wonder Triton’s Entrees include Oven Baked Salmon Royale. The Truffled Cauliflower Puree is excellent. 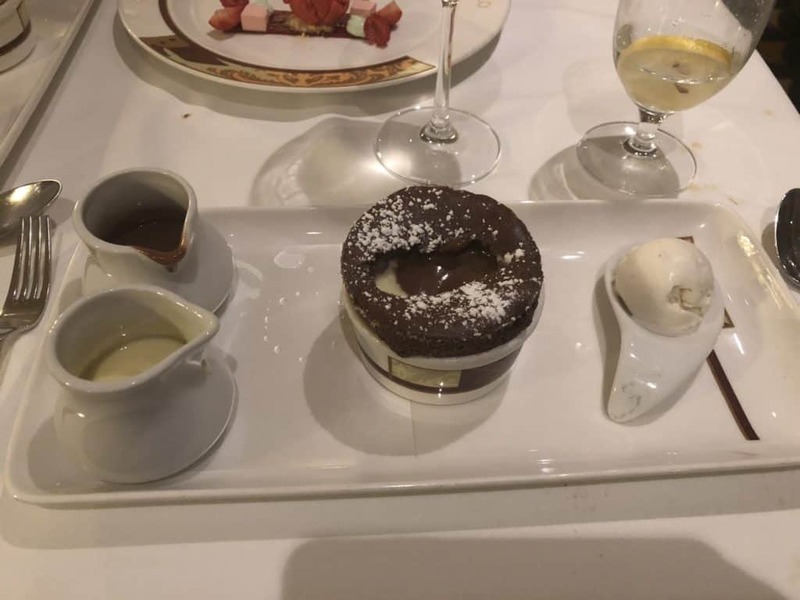 The French influence can also be seen in the deserts which include creme brûlée, grand mariner soufflé and brioche and pannetone pudding. The Triton’s menu has one of my very favorite deserts. 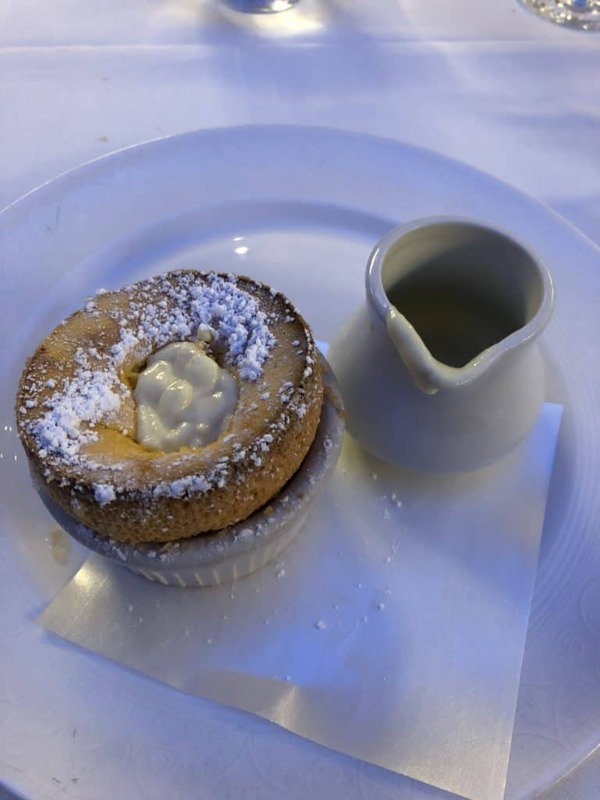 This is the Grand Marnier Souffle which is served with Grand Marnier Creme Anglais. 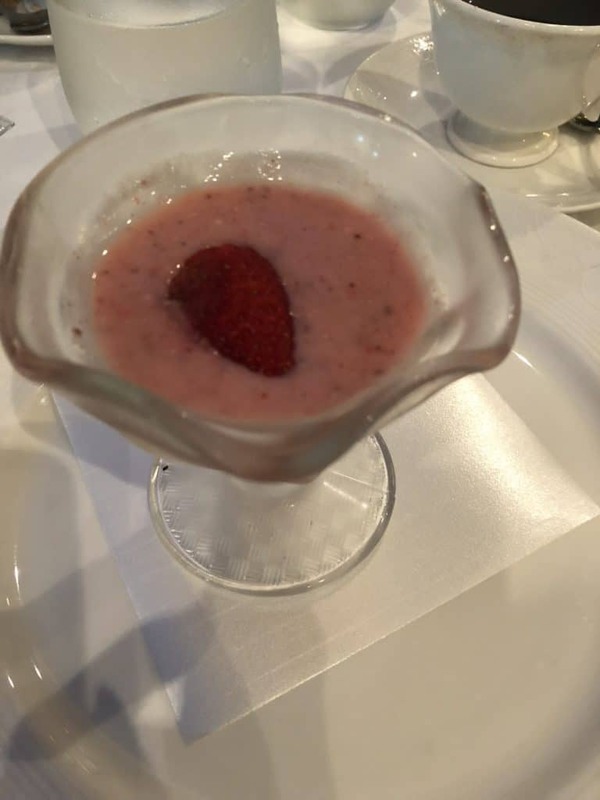 I actually think that this is better than many of the Palo dinner deserts. Lumiere’s is exclusive to the Disney Magic. It is themed for Beauty and the Beast. 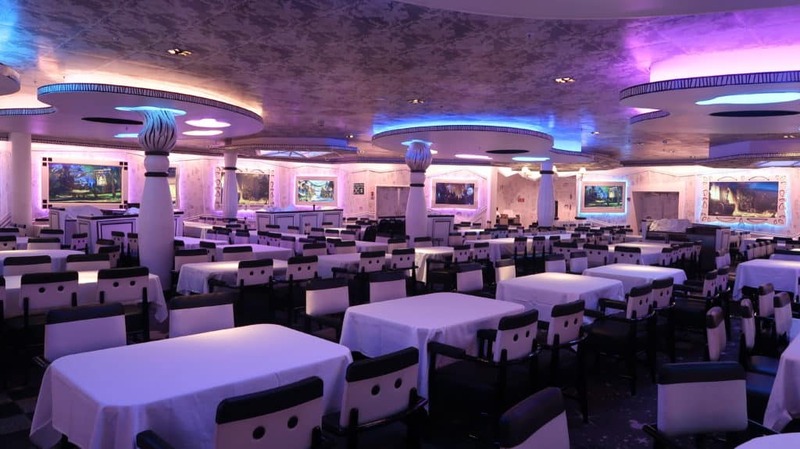 It is interesting to see how much Disney cruise restaurant design has evolved over the years. 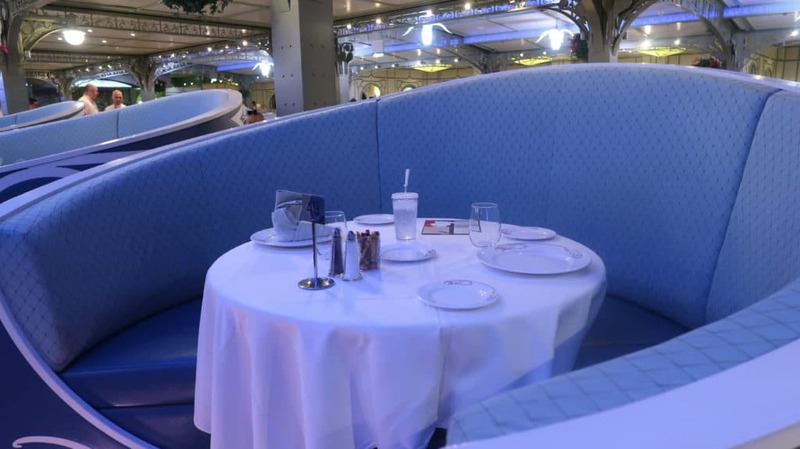 Triton’s and Lumiere’s are the original restaurants on the Classic Disney Ships. They were beautifully themed, but do not have the extent of the immersive experience which you now have at Tiana’s Place on the Wonder and Rapunzel’s Royal Table on the Disney Magic. Lumiere’s serves the embarkation lunch. It also serves breakfast, lunch and dinner every day of your cruise. 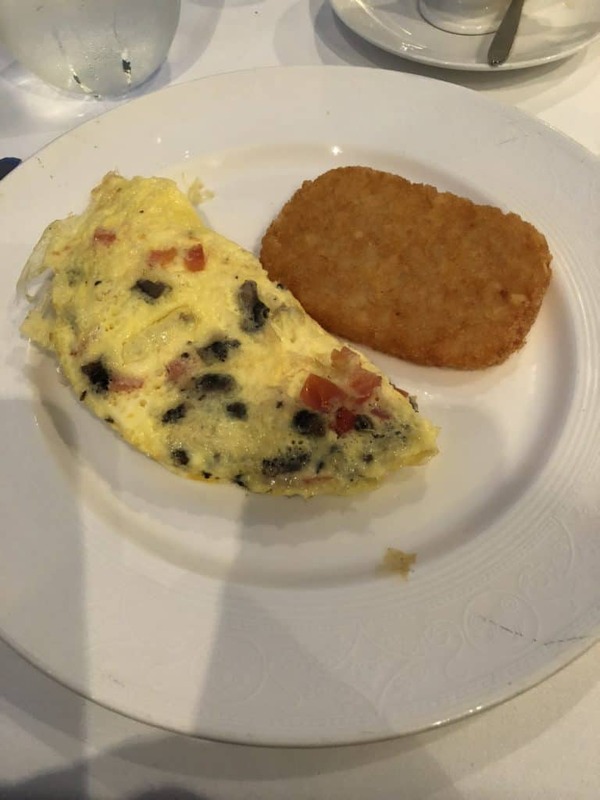 Make sure that you try Lumiere’s breakfast at least once during your Disney cruise. This was the Mornin’ Tug Boat – a blend of strawberries, Bananas, Almonds, Raisin Granola and Low-fat yogurt. If you are like most of the guests on a Disney cruise you will be looking forward to the food at the buffet. It’s included in the cost of your Disney cruise. There is a lot of choice, it’s good quality and it is all you can possibly eat! 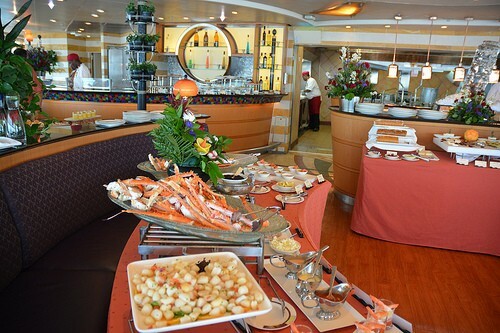 As soon as you board your Disney cruise ship you will be encouraged to visit the buffet for lunch. 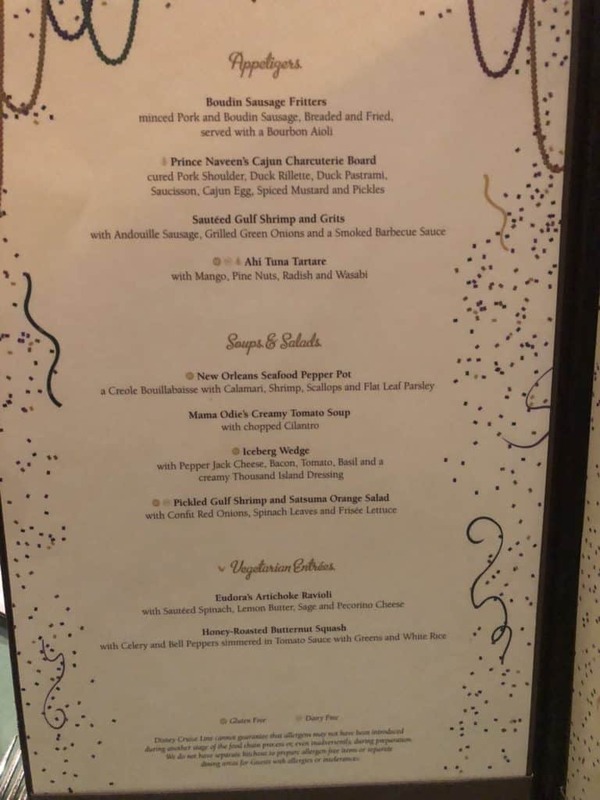 As you have seen, there are different sit down a la carte options available, but most guests immediately head for the buffet as soon as they board a Disney cruise. The buffet on all the Disney ships is now called Cabanas. The names used to be different, but now all have been brought under the same name of Cabanas. The buffet is open for breakfast.lunch and dinner. Remember that if you have any special dietary needs this can be accommodated. Just tell one of the Cast Members at Cabanas and they will help you out. There is a huge amount of choice at the buffet. The problem is not finding something to eat. Rather it is not finding too much to eat. Just be careful as it is very easy to pile on the pounds very quickly no matter how many times you go to the gym on board! There is a special buffet in Cabanas on Pirate night. Just when you think you really cannot eat any more, you discover that you really can eat some more buffet food if you try! Every Caribbean, Bahamian and Mexican cruise has Pirate Night. The Pirate Buffet will be held in Cabanas from 10.30 until 11.15. 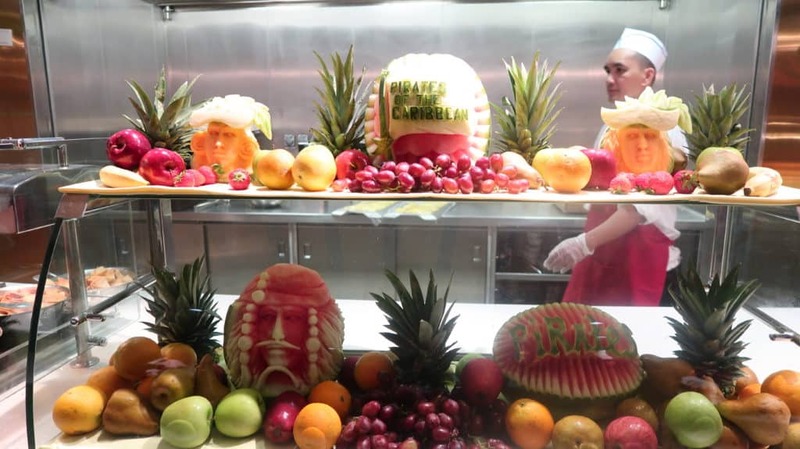 The Pirate Buffet is known for the wonderful fruit carvings and pirate themed decorations. Even if you aren’t hungry you should go and have a look at the displays. If you are sailing on a Disney cruise of 7 nights or longer there will be a chance to attend a character breakfast. If any of you have had a character breakfast in one of the Disney parks you know that this is a great opportunity to meet the Disney characters. 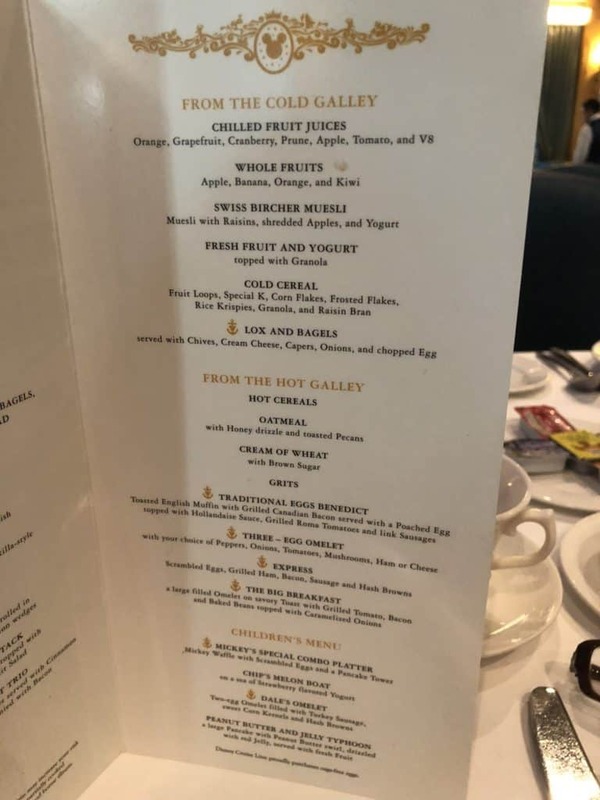 You will also know that a character breakfast in the Disney parks can be an expensive experience. You will be paying around $150 for a family of 4 in the parks. The wonderful thing about a Disney cruise character breakfast is that it is included in the cost of your cruise. 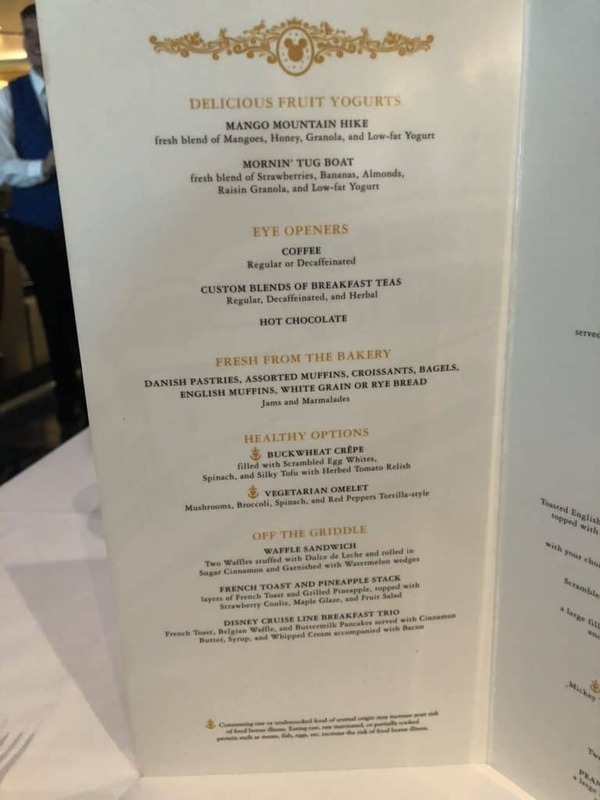 You do need to know that a Disney cruise character breakfast is included, but you do need to get a ticket so that you can attend the breakfast. Tickets to the Disney cruise character breakfast are available online in your Cruise Personalizer. As soon as you are able to book activities online, you should go to your Cruise Personalizer and get one of the character breakfast tickets. If you do not get a ticket before you sail, there may be some available by visiting Guest Services as soon as you board your Disney Cruise. However, you need to know that these tickets are highly sought after and may not be available. Always get one online before you cruise if you possibly can. 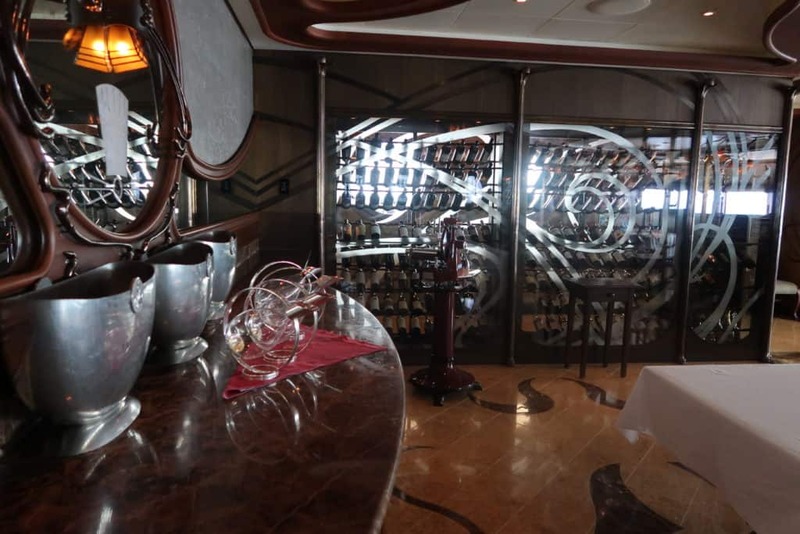 Disney Cruise Palo Restaurant is an adult only premium dining venue on all of the Disney Cruise ships. You have to be over 18 to dine at Palo. Palo offers dinner every night of your cruise and Palo Brunch is offered on Sea Days. You really should indulge in at least one Palo dining experience on your cruise. Both dinner and Bruch at Palo cost $40 per person. Gratuity is extra. At Palo Bruch, this includes a glass of sparkling wine or a Mimosa. An extensive wine list is available for both Palo Brunch and Palo Dinner. Palo Brunch is a combination of buffet items and an al la carte menu. The buffet is high quality and has a lot of choices for everyone. I really like the huge variety of seafood which is available at Palo Brunch. You can also order from the Disney Palo menu. The entrees are both breakfast and lunch items. You can order as much or as little as you want. 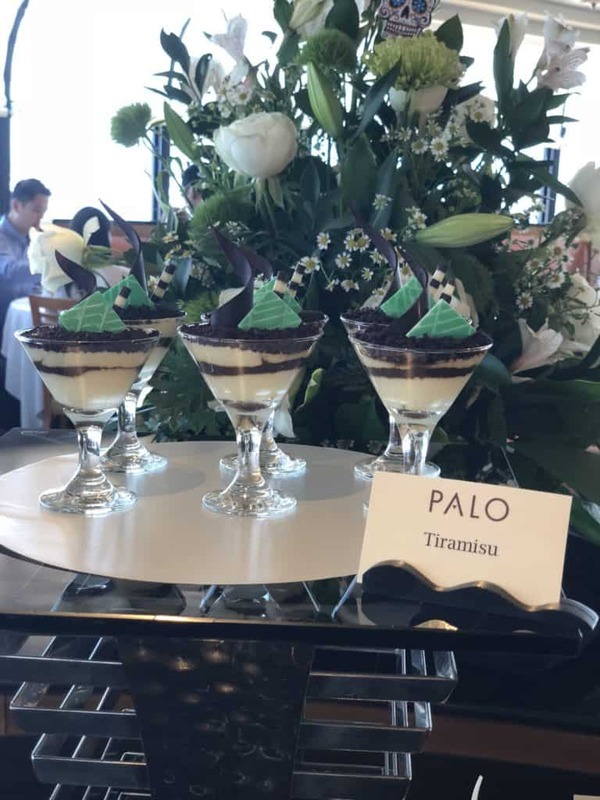 One of the best features of the Palo Brunch is that you can choose as many deserts as you want! Because it will be impossible to choose just one Palo dessert. 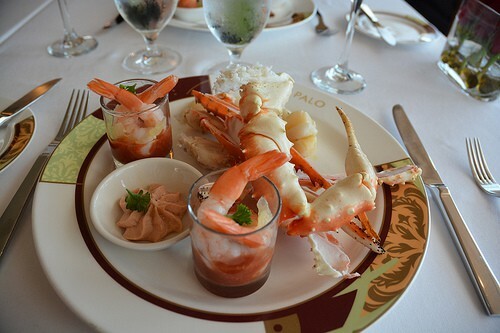 A Disney Cruise Palo Dinner is served a la carte. 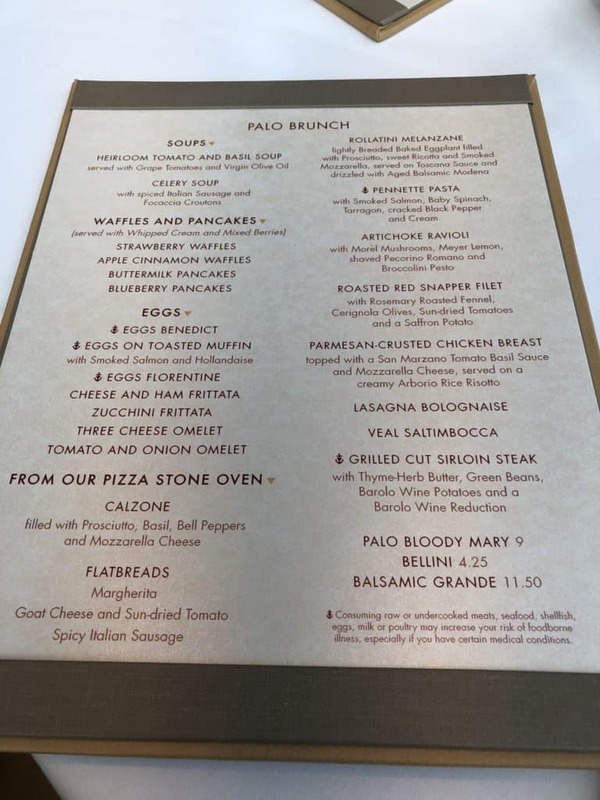 There are plenty of menu items at Palo dinner to tempt every guest. 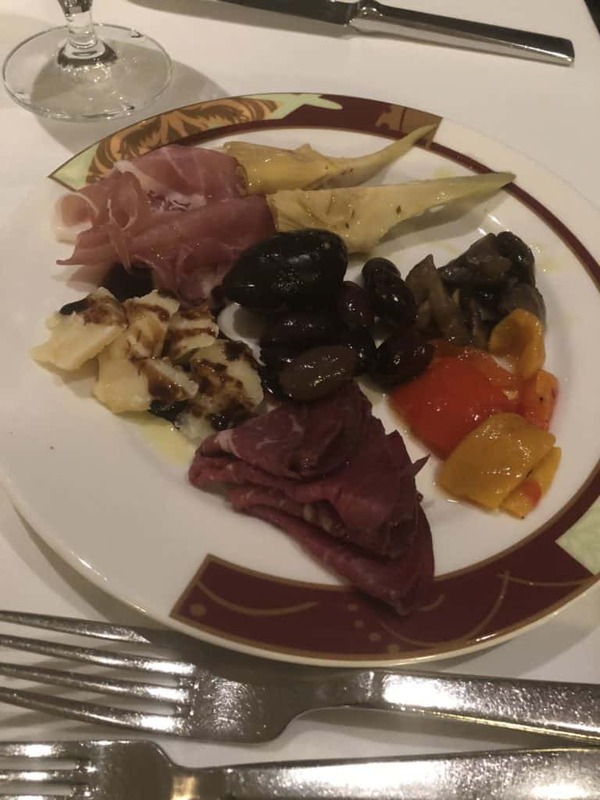 The first course is always anti pasti which is served to you table side. 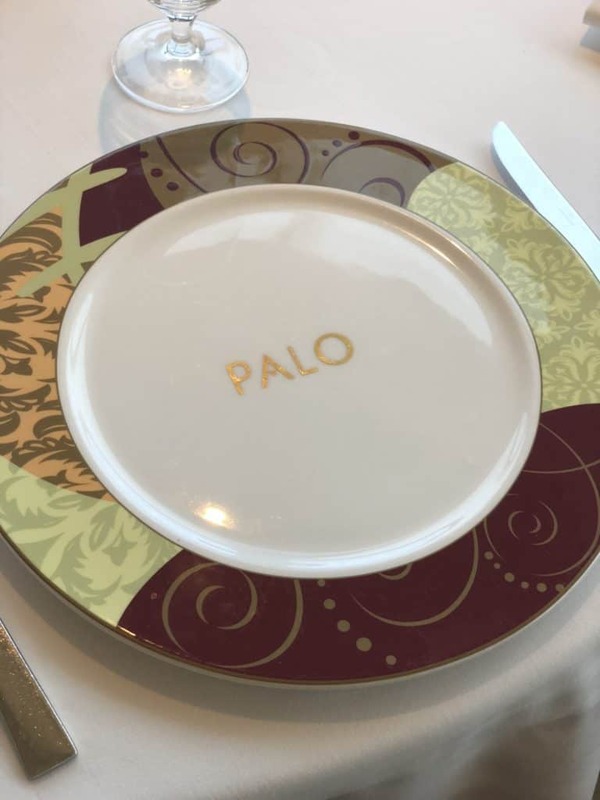 The service at Palo is exceptional. Somehow the Palo servers know when you need them. And when you don’t. One of the most popular Palo desserts is the melting chocolate cake. It’s the perfect way to round off your meal at Palo. Many people, including me, prefer Palo Brunch over Palo dinner. It is a close call as both experiences are special. However, Palo dinner means that you have to miss one of the Rotational Dining experiences. I love the rotational dining restaurants so would prefer not to miss them. Also, I think that Palo Brunch offers a higher quality experience. I like the concept of being able to choose your own food items from the Palo buffet. For more on this, you can read our Palo Dinner v Palo Brunch guide. 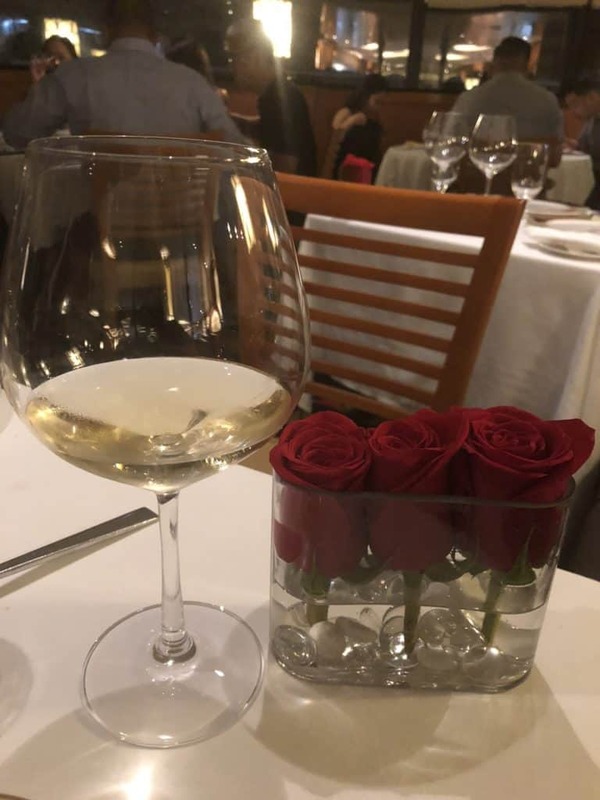 If you are sailing on board the Disney Fantasy or the Disney Dream then you will have the opportunity to dine at one of the very best restaurants at sea. Remy is themed after the Pixar movie Ratatouille. There can’t be many restaurants named after a rat, but Disney always does things slightly differently. Anyone Can Cook may be the theme of the Ratatoiulle movie. However, if you dine at Remy you will know that not just anyone can cook to this high a standard! 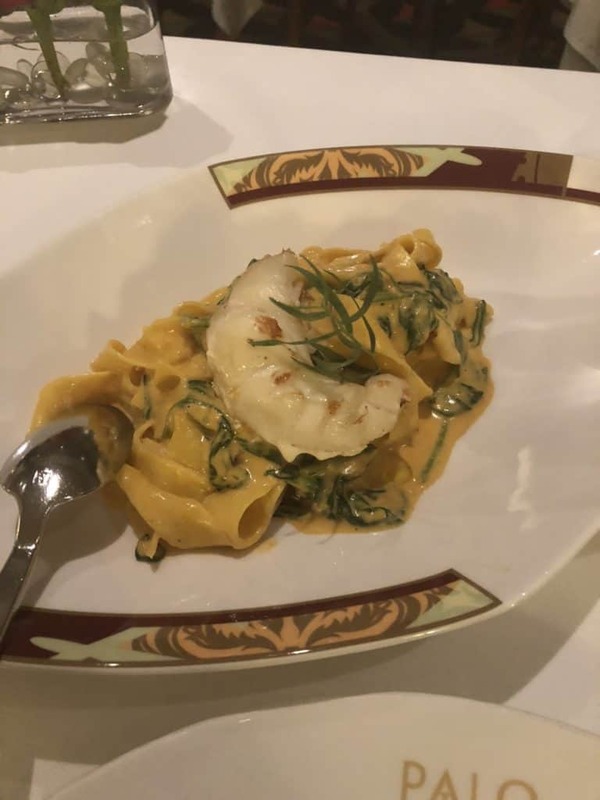 If any of you have been lucky enough to eat at Victoria and Albert’s in Walt Disney World you will know that Disney restaurants can be exceptional. To achieve this standard at sea is an even greater feat. The menu as you would expect is French. The menu is created by not one, but two renown chefs. 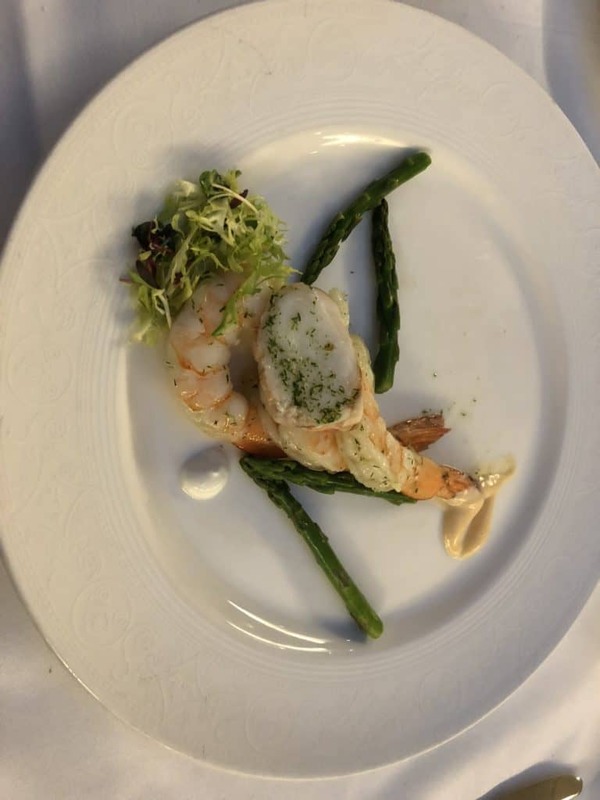 Chef Scott Hunnel of Victoria and Albert’s and advising Chef Arnaud Lallement a 3 Michelin starred acclaimed owner of l’Assiette Champenoise restaurant in France, each create the menu. The Remy menu changes frequently. The emphasis is on using only the best ingredients which are in season at the time. Remy is beautifully and very subtle in it’s Ratatoiulle theme. If you dine at Remy take some time to look at the themes in the decor. 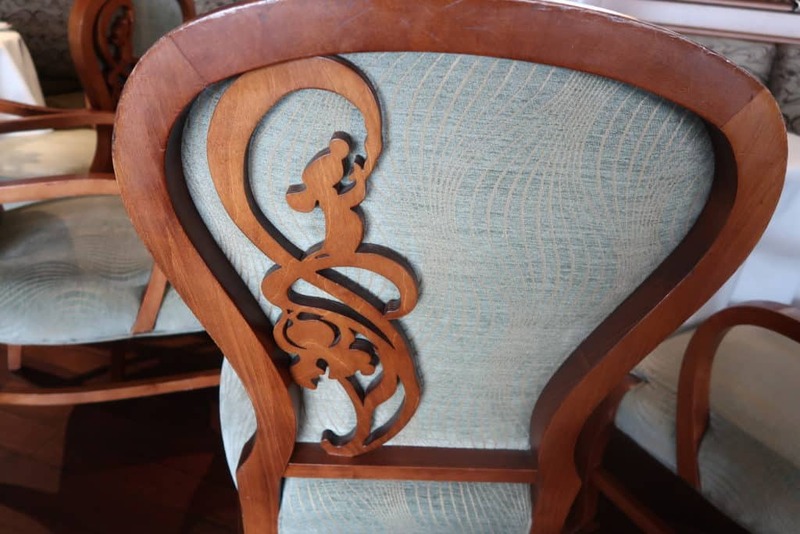 The chair backs have everyone’s favorite rodent carved into the design. Remy restaurant on the Disney Dream and Disney Fantasy offers four different dining experiences. These are Remy Champagne Brunch, Remy Dinner, Remy Dessert Experience and Petites Assiettes de Remy. Remy Champagne Brunch is a very indulgent experience. Costing $75 per person with an additional $30 if you have the optional champagne pairing, this is not an inexpensive experience. However, we feel that everyone should experience a Remy Brunch at least once. You Champagne Brunch will begin with some time spent waiting in the Meridian Bar. This is one of those places that you do not really discover unless you dine in either Palo or Remy. The Meridian Bar is located between both of the adult dining restaurants on the Fantasy and the Dream. It is the perfect place for a pre meal drink. Your Brunch experience then continues when you will be taken into the Remy restaurant with a group of your fellow diners. You will be served a small plate of amuse boche and a complimentary glass of champagne. If you want more, you have to add the champagne pairing. Your server will then show you to your table. 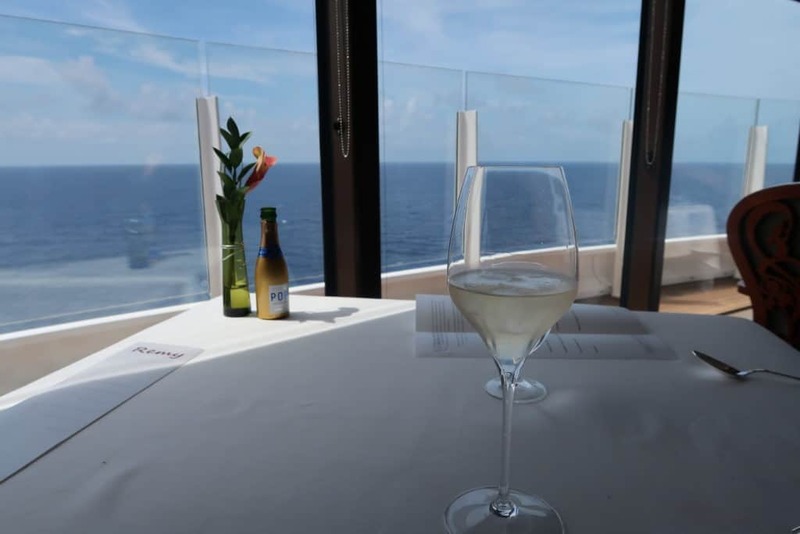 You can’t fail to be impressed by the beautiful table setting and the wonderful views of the ocean. There is even a designated stool for you to rest your purse! The waiter will then talk about the menu selections so that you have the best choices. Another option in the Remy restaurant is the Remy Dessert Experience. If you enjoy desserts you will love this 5-course dessert menu served with coffee. This Remy experience is $60 per person. The wine pairing adds $25 per person. Petites Assiettes de Remy is available for a charge of $50 per person and this includes the wine paring. For this Remy experience, you combine small plates with a 6 course wine tasting. The Petites Assiettes de Remy is hosted by the Executive Chef and the Sommolier of Remy. It is only available on the first day of your Disney cruise sailing and is held in the early evening. 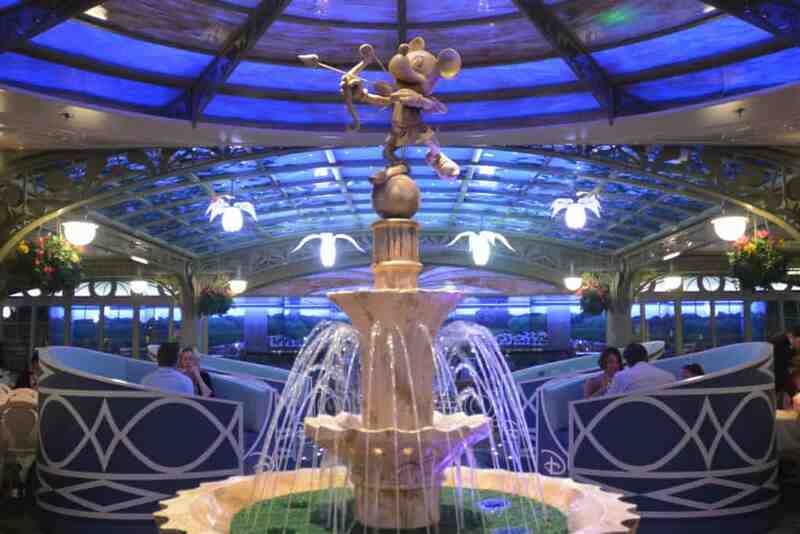 The main event in this premier Disney Fantasy and Dream restaurant is the Remy dinner. This is available on every day of your cruise. Remy Dinner a splurge at $125 per person. Add another $105 if you want the wine pairing. However, dining at Remy is an experience which you really should indulge in at least once in a lifetime. Disney’s Remy is an exceptional restaurant. Even though the charge seems high it is very reasonable if you compare Remy with the value that a similar standard restaurant has on land. 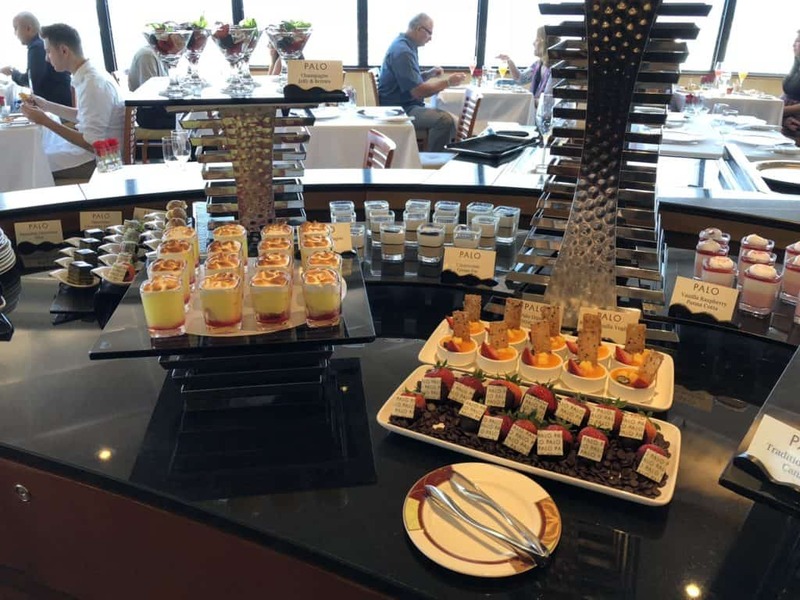 In addition to the restaurants and room service, there are a number of other locations where you can find food on the Disney Cruise ships. One thing is for certain. 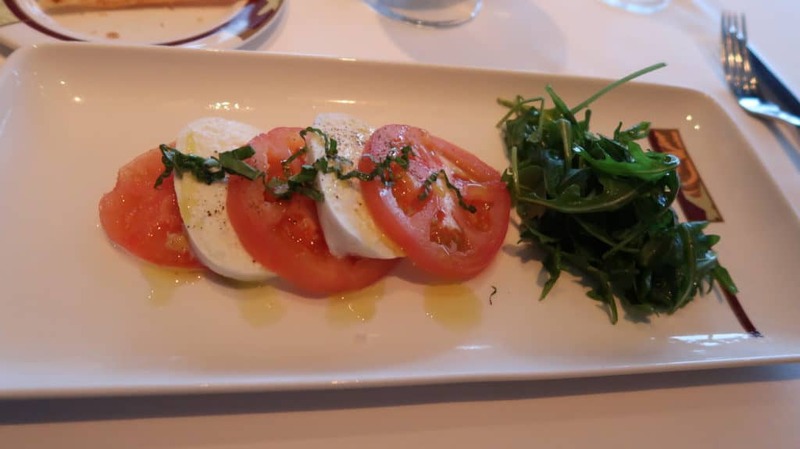 You will not go short of food on a Disney Cruise! 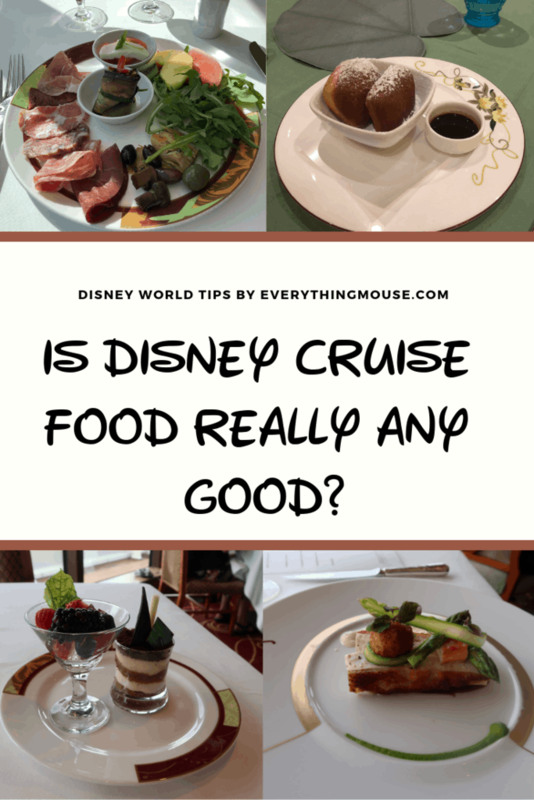 All of the food is included in the cost of your Disney cruise unless otherwise stated. This is located on the Pool Deck 9 of the Disney Magic. This is a great new dining venue which serves fresh shawarma. You will also find your classic American favorites of hamburgers and hot dogs. This is one of the newest options on the Disney Fantasy. If you have a sweet tooth this will be your favorite place to be. It offers ice cream and sweet treats for an extra charge. This is the equivalent of Sweet on You but is located on the Disney Dream. Everything is an additional charge, but is sure is tempting! Flo’s Cafe is available on the Disney Fantasy and the Disney Dream. This Disney Cars inspired pool deck eatery is home to Luigi’s Pizza, Tow Mater’s Grill and Fillmore’s Favorites. Here you will find burgers including veggie burgers and fish burgers, hot dogs, salads, sandwiches and pizza. This is on the Disney Wonder and the Disney Magic. Here you will find pizza. There is always a vegetarian option and a gluten-free pizza is available on request. No prizes for guessing that idea cream is available here. Self serve soft ice cream is available. You can order specialty smoothies here for an additional charge. You can even get the famous Dole Whip here for a small fee. This is available only on the Disney Wonder Pool Deck 9. Classic American food such as burgers, hot dogs and tacos are available here. This is one of my favorites on the Disney Wonder and the Disney Magic. It offers salads, sandwiches, fruit and wraps. It is located on the pool deck just outside Cabanas. This is unique to the Disney Fantasy and the Disney Dream. This offers smoothies and healthy drinks for an additional charge. It is located just outside the gym and close to the lobby of the spa. This is located outside the Walt Disney Theater on all of the ships. It is mostly a bar, but it also sells candy and popcorn to watch during the show. They always have really cute refillable popcorn buckets for sale. These can be purchased and then used for discount popcorn for the duration of your cruise. Another great thing about Disney Cruise Lines is that Room Service is available 24 hours a day. 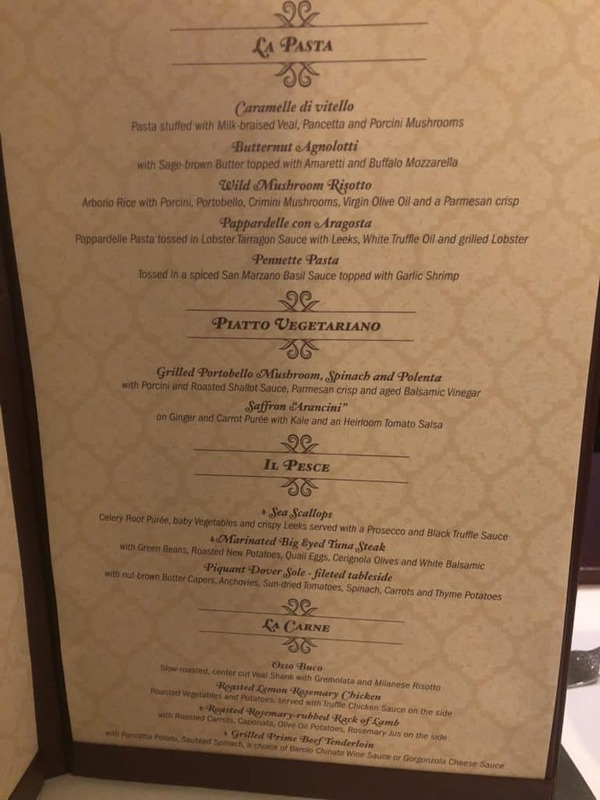 Most of the Room Service Menu is included in the cost of your Disney Cruise. Although the food is free remember to tip your server. You can do this either in cash or by adding an amount to the check which they will bring you. It will have no charge unless you have ordered one of the items on the Room Service Menu which does have a charge. One thing which we always like to order, particularly for the Sail Away, is the All Hands on Deck platter. This has cheese, crackers and fruit. You can order such things as New York Steak Panini with Caramelized Onions and Horseradish or a Tomato, Basil and mozzarella Panini. The cake of the day is also usually a good option!. If you want to order breakfast you can fill in the card which you will find in your room and order breakfast for a set time in the morning. This is another one of my favorite places to sit and relax. The Cove Cafe is available on all of the Disney ships in the over 18 adults only section. 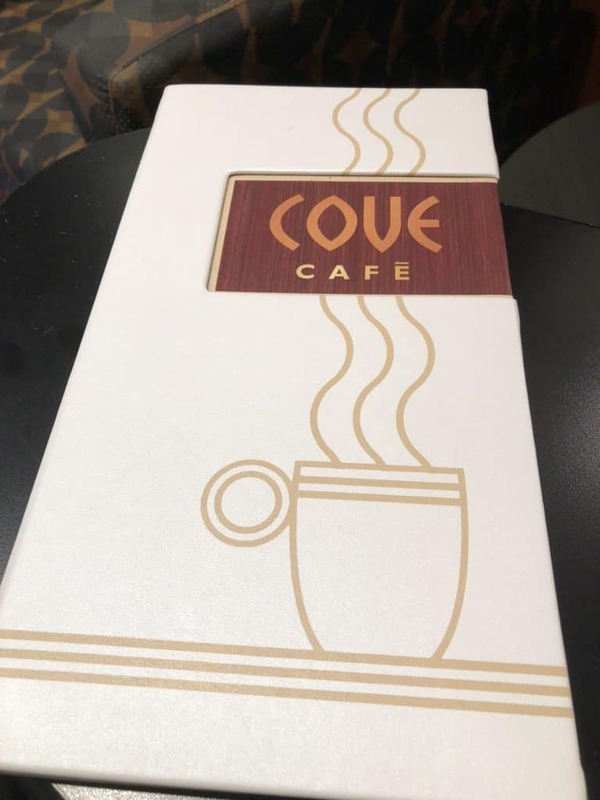 Cove Cafe charges for specialty coffee and adult beverages. However, there is always a selection of pastries and cakes available for free. If you need a late night snack, Disney has you covered. Disney Cruise food is available late at night in select locations! 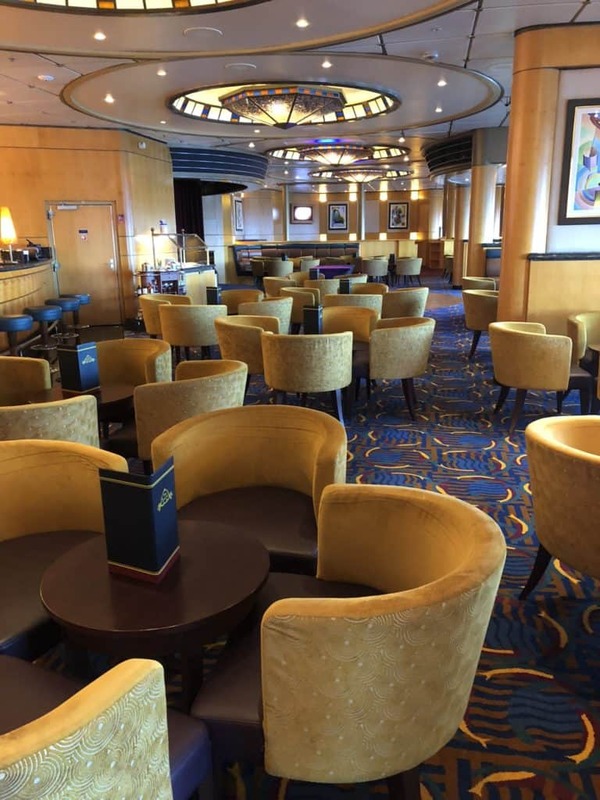 On the Disney Magic, you will find late night snacks in O’Gills pub and the Promenade Lounge. On the Disney Wonder, it is in the Crown and Fin and the Promenade Lounge. Usually, the hours are from 10.45 to 11.30. If you want a late night pizza, Pinnochio’s Pizzeria is open on both the Disney Magic and the Wonder from 9.30 until midnight. On the Disney Dream the late night snacks will be located in The District from 10.45 until midnight. On the Fantasy the snacks are found from 10.45 until midnight in La Piazza. On the Disney Dream and the Fantasy Luigi’s Pizza is open from 9.30 and closes at midnight. Remember that Room Service is available 24 hours a day if you really need a snack at 2am! One of the highlights of your Disney cruise may be a port stop at Disney’s Private Island Castaway Cay. If you are sailing on a Disney Bahamas or Caribbean cruise Castaway Cay will be one of your port stops. You do not need to go back on to the ship to eat. A barbecue lunch is served on Disney’s Castaway Cay. Food is served from 11.30 until 2.00. There are three barbecue lunch locations on Disney’s Castaway Cay. Cookies One is usually the least busy and it’s also the closest to the ship. 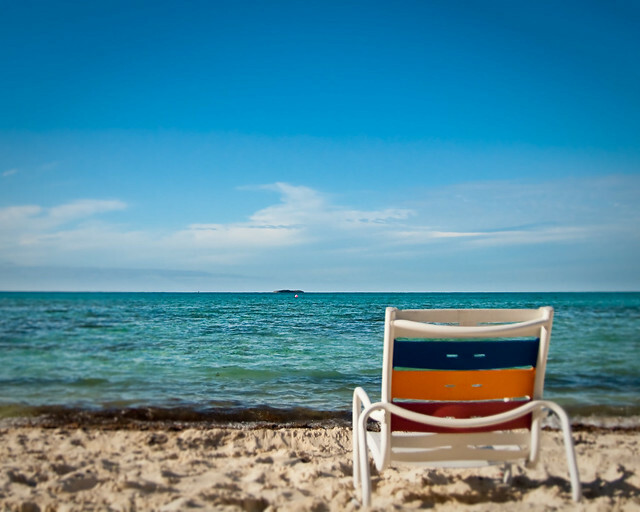 Cookies Too is located closest to the Family Beach on Castaway Cay. Both Cookies One and Two serve the same food. It is typical barbecue fare of burgers, salads, chicken, fish, hot dogs corn on the cob, fruit and cookies. Self serve ice cream is also available. There are soda stations which are free, just like on the Disney ship. 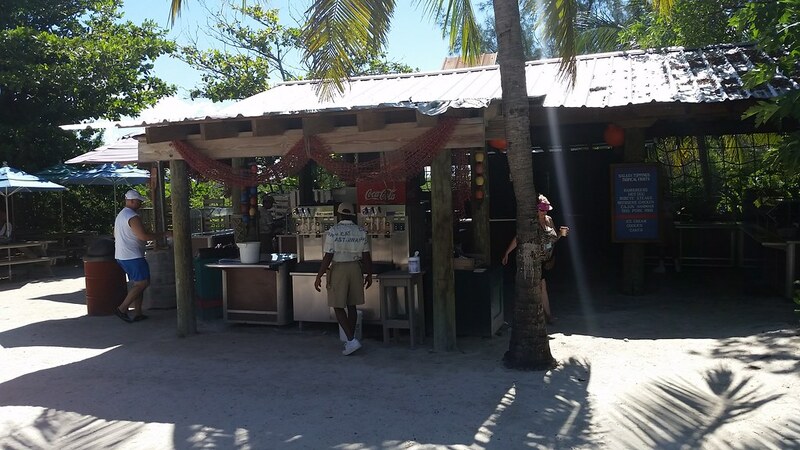 If you want an alcoholic beverage there are plenty of bar locations on Castaway Cay. 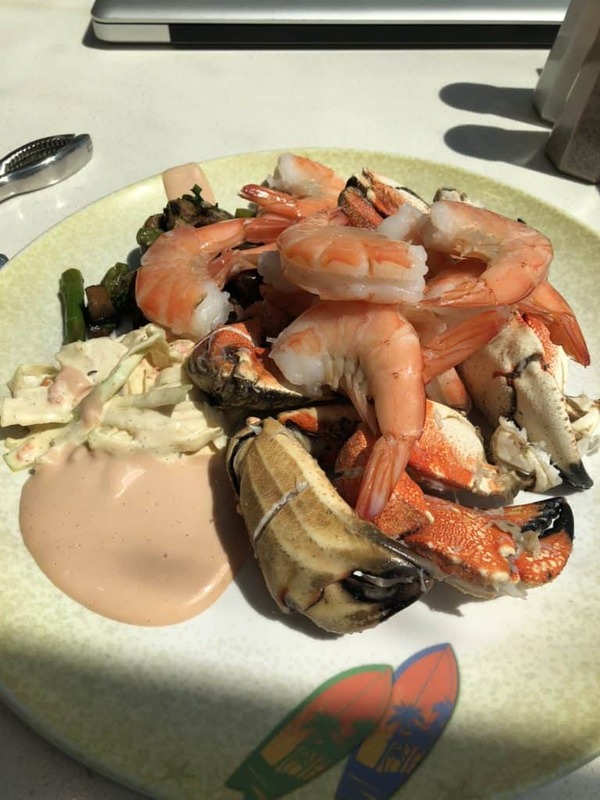 Remember that if you have food allergies you should talk to your Server the night before your Castaway Cay visit and they will make sure that there is something available for you on Castaway Cay. The third food venue on Castaway Cay is the Serenity Bay BBQ. This is located on the adults only beach, Serenity Bay. I prefer this venue but of course, you can only go there if everyone is over the age of 18. The only place you can get barbecue ribs on Castaway Cay is the Serenity Bay BBQ. I always think that the food tastes a bit better at this location. Possibly because they are catering to fewer people. There isn’t much seating available here but I have never had a problem getting a table. Which is your favorite Disney Cruise Food? Let us know in the comments below!